With nearly six months of preparation and almost as many months of anxiety, the SHSU Mooters were ready to compete in the final moot court competition of the season. 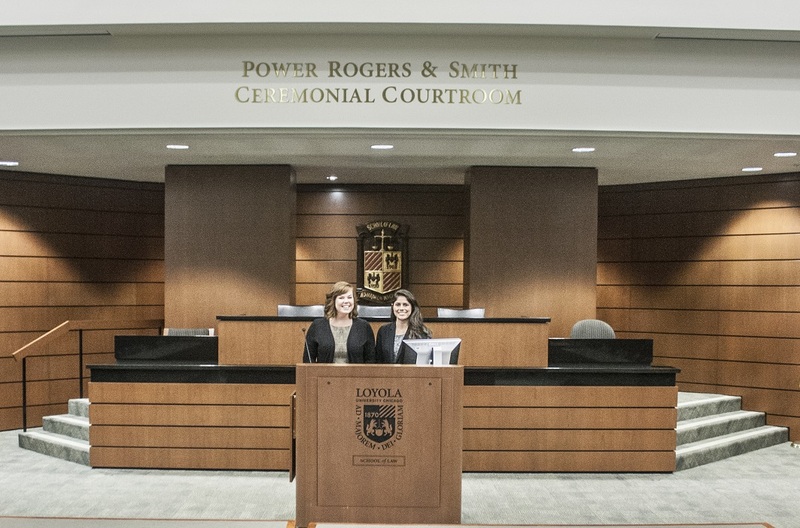 Hosted at Texas A&M Law School in Fort Worth, 31 teams from across the state and the southern United States competed for spots at the National Competition. After waking up, we faced a morning of studying and non-stop practicing in anticipation to our afternoon’s competition. 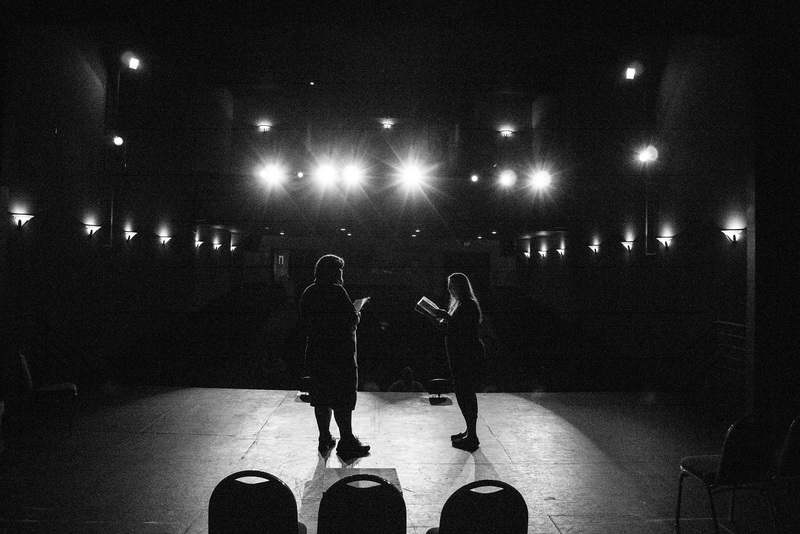 Once we were given our room assignments, pairings, and rules, each team departed for their first round. 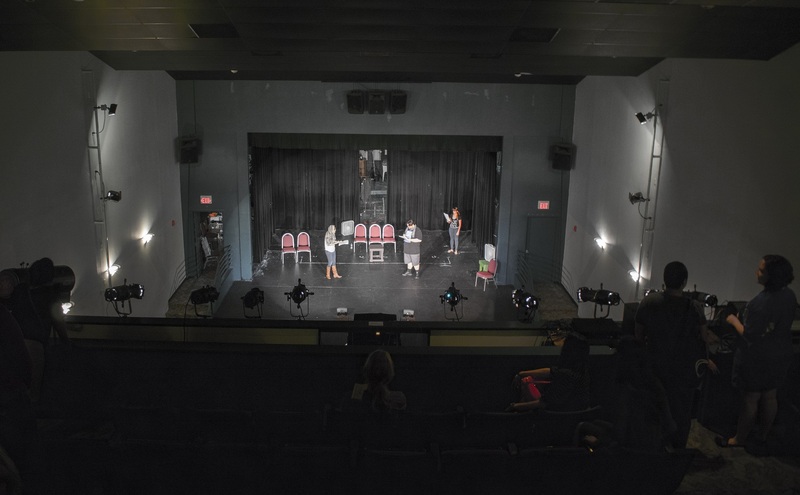 The competition consisted of three back-to-back rounds that would determine the day’s rankings according to mastery of material, presentation, response to questions, and courtroom demeanor. Throughout the day, it was slightly intimidating how we would be contending spots against students from such universities as University of North Texas, The Air Force Academy, Texas A&M, and Baylor. 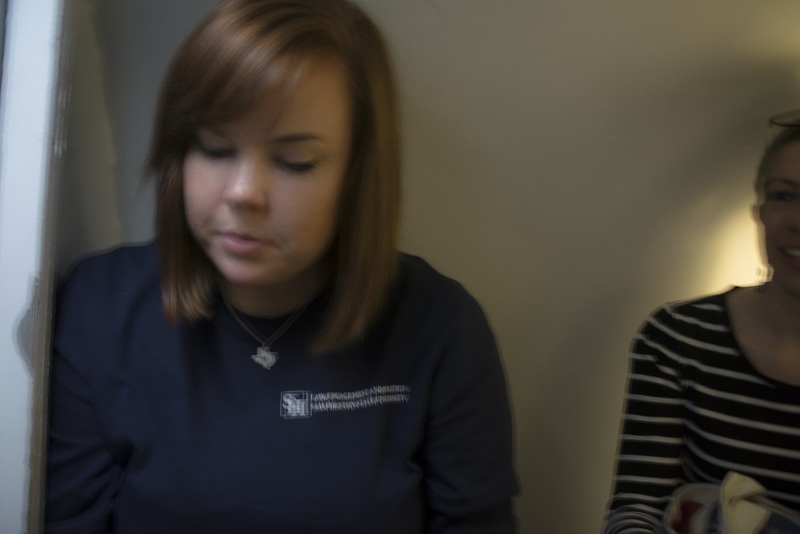 As each round progressed, our nerves slowly diminished and we felt more confident that our studying was paying off. After the third round, we regrouped for a much needed dinner catered by Texas A&M Law School. 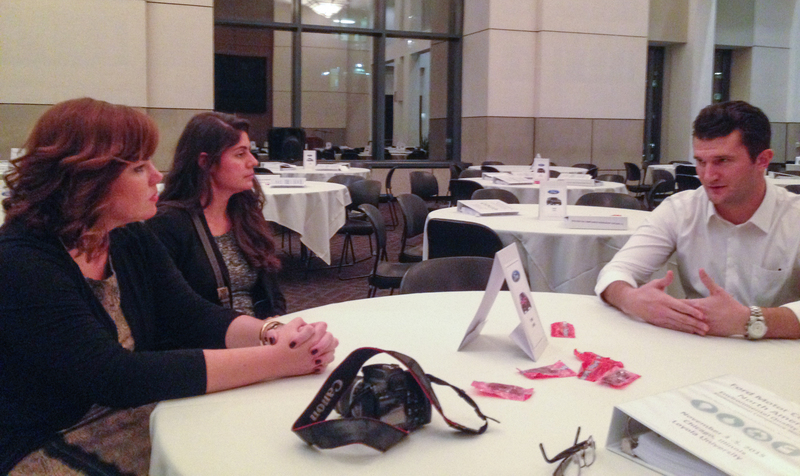 As we enjoyed our meal and waited for results, we conversed with a couple Texas A&M Law School students to know more about life in law school. We also shared opinions among ourselves regarding our the day’s competition. Reminiscing on the day’s toils, we reflected on what we could have done better and what we did well. After what seemed like hours of waiting, the tournament director announced the advancements and speaker awards. Unfortunately, SHSU did not advance to the second day of competition. 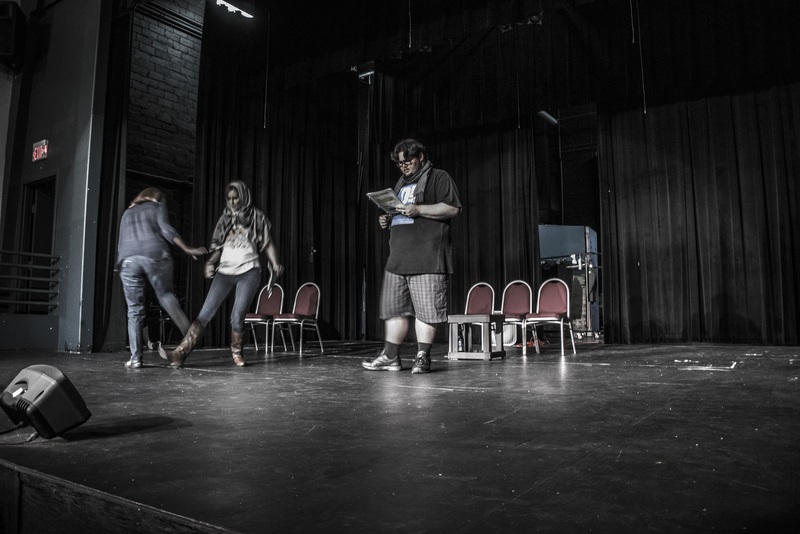 Regardless, we noticed how each SHSU team had improved from the scrimmage and earned higher scores, with four of the SHSU students finishing in the top half of orators. The outcome reminded us that sometimes winning or losing is not what matters. What really matters is that we learn and whether we are more prepared for our future careers. For each member, we thought we achieved this goal throughout the season. We ended the day on a positive note taking our group pictures in the courtroom! After working hard and competing in the Moot Court Regional Tournament, on Saturday the team set out for sightseeing across Fort Worth. We visited the Amon G. Carter Art Museum, the Fort Worth Water Gardens, and the famous Sundance Square. 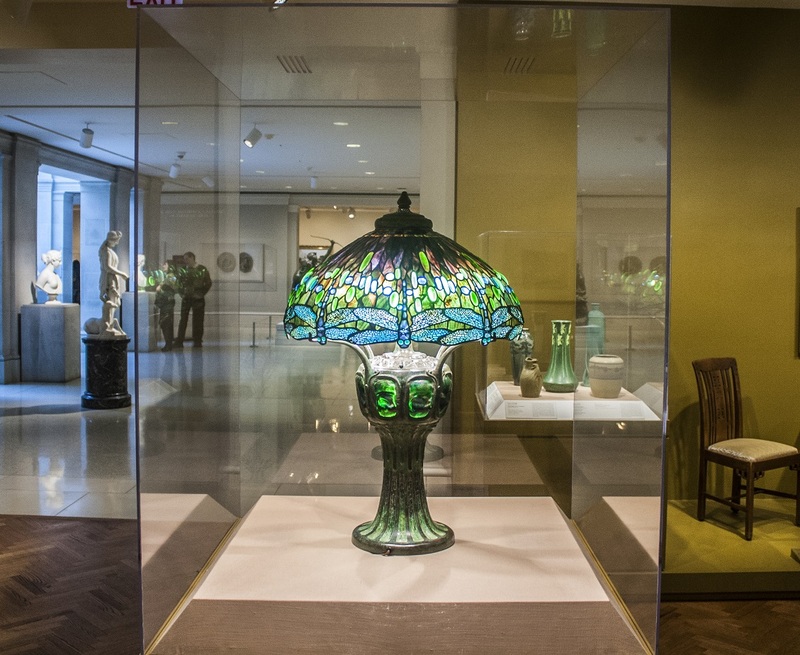 The Amon G. Carter Art Museum is a free art museum dedicated to 19th and 20th Century American Art. 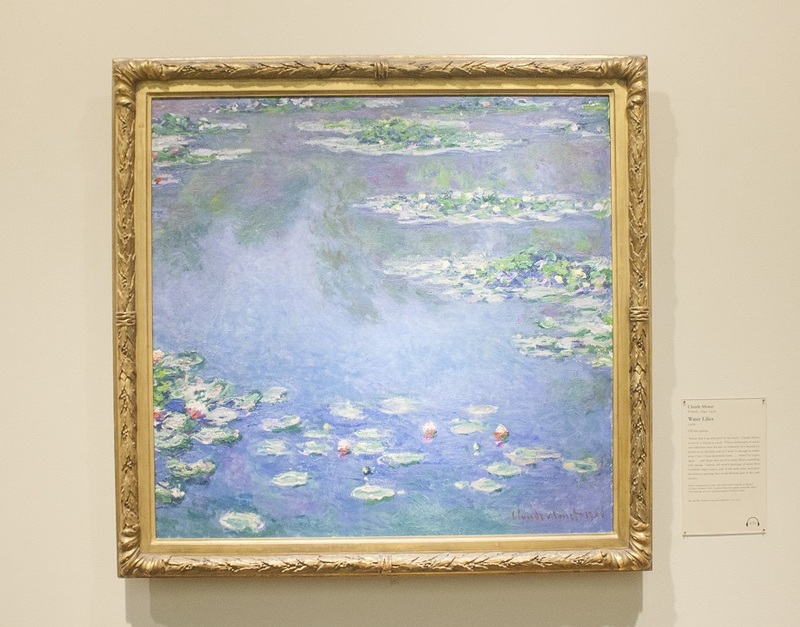 …the museum leads visitors through various decades in American art history. Among the halls was a more contemporary exhibition titled “Border Cantos.” In the exhibit, Photographer Richard Misrach and Composer Guillermo Galindo, depict the US/Mexican border through impactful photographs and music that reflect immigrant life along the borders. 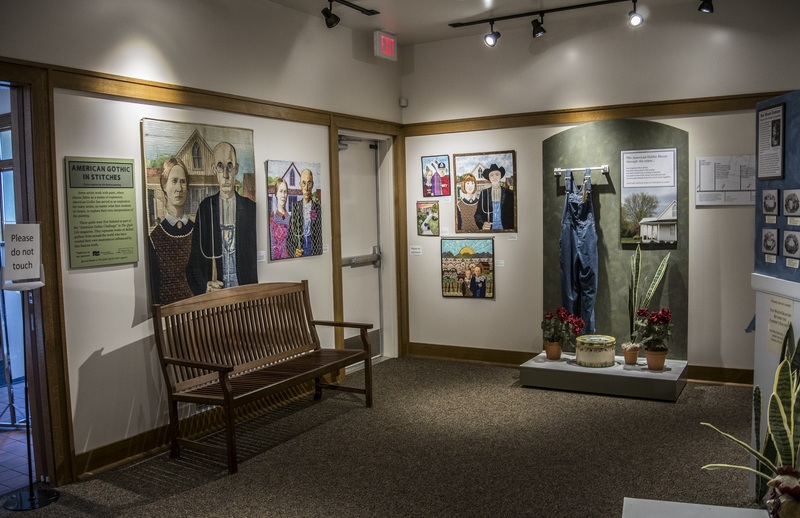 As the photographs depict a solitary and barren border, visitors felt a deep emotional connection to the people affected everyday by the walls, fences, and wire the divide the American and Mexican territory. This exhibit proved to be the team’s favorite in the end. After exploring the museum and learning about American Art, we were excited to move on to our next stop: the Fort Worth Water Gardens. 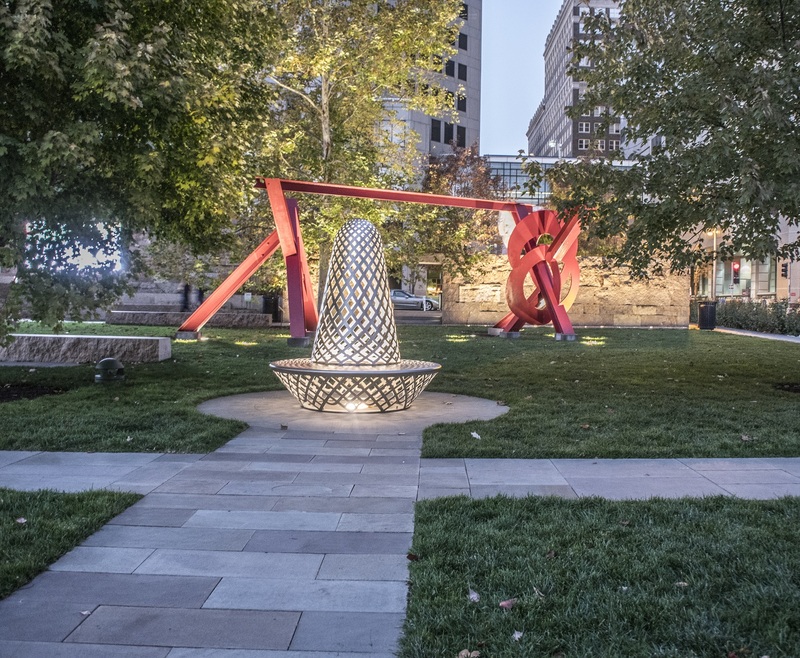 Designed by Philip Johnson, the urban park provides a soothing atmosphere to escape from the mundane city life (and moot court). 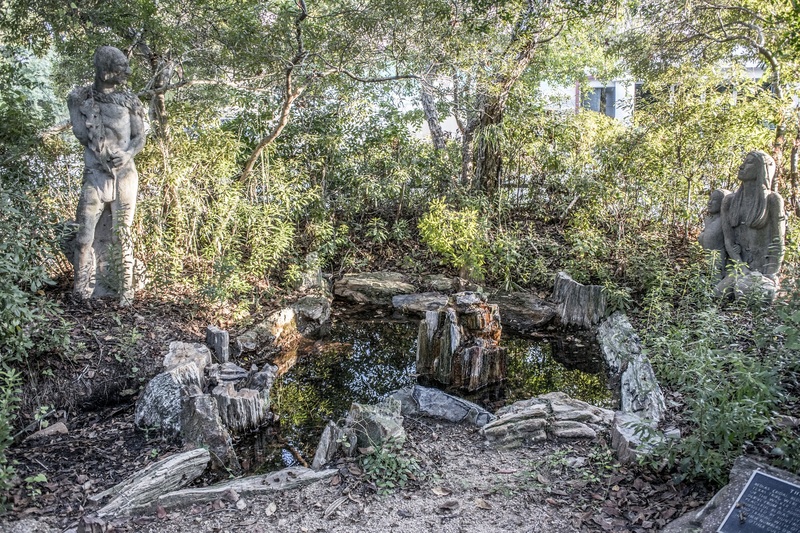 The park is composed of adjoining water gardens which visitors can explore. 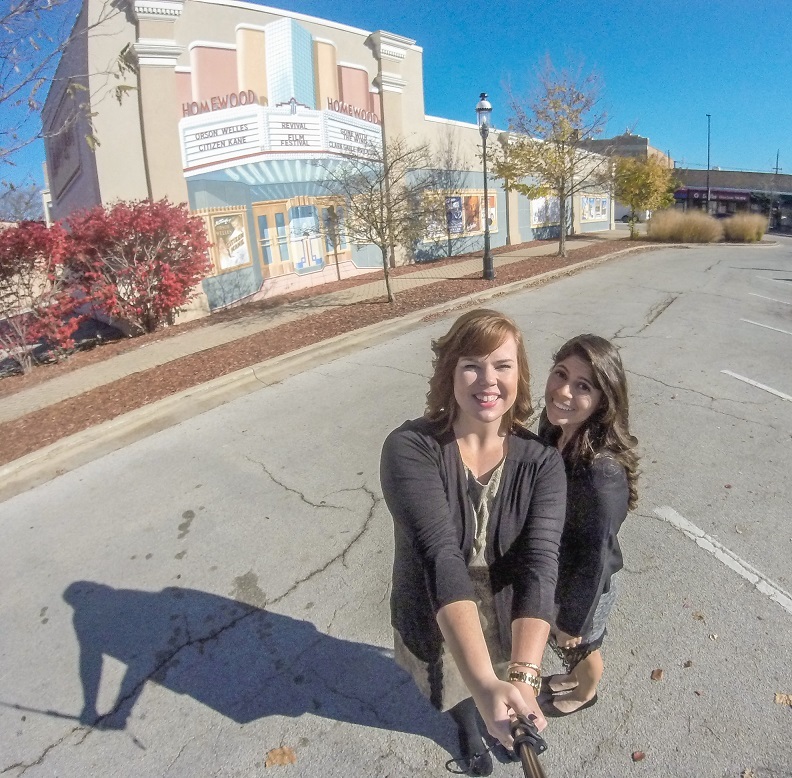 True to our millennial drives, we enjoyed taking selfies and pictures of the garden. The Water Garden was an unexpected treat that everyone enjoyed! Our mini Fort Worth tour sadly ended with lunch at Bird Café in Sundance Square. 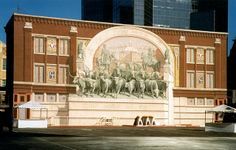 Revived with the help of Richard Haas’s Chisholm Trail mural, the Square is now the center of shopping and entertainment in downtown Fort Worth. In the midst of the cultural hive, The Bird Cafe as a very popular brunch joint, offered many unique dishes. We each tried something different (for different was the only thing the Cafe offered) such as Carne Asada Waffles, an Avocado Omelet, and the Hickory Smoked Chuck Burger. After our delicious platters, we decided to finish our meals with a sweet closing. So being, we chose to visit a nearby chocolate factory! The Chocolate Factory was a fun and tasty last stop on our trip. We immensely enjoyed sampling numerous sweet treats. With full stomachs and a nap waiting for us in our van seats, we departed Worth Wort to make our way back to Huntsville. Many thanks to Texas A&M Law School for hosting the TUMCA Moot Court Competition and to Ms. Loveall for all her hard work and dedication to our teams success! It seemed too soon to reminisce about the first half of our trip, which was filled with fun activities and meeting great people. 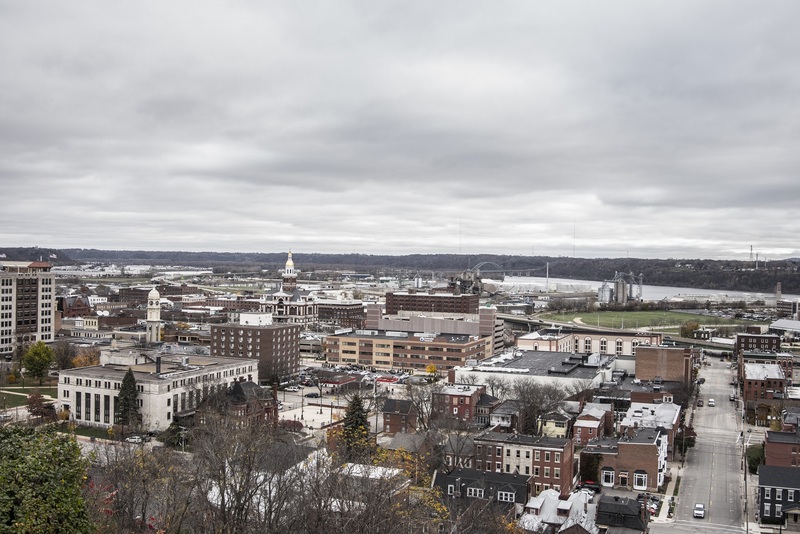 But, as we packed for our next destination early in the morning, contemplated the great people we had met and the fun of visiting Little Rock, Memphis, Nashville, Louisville, Lexington, and Frankfort. But with St. Louis on our destination list for today, we hastened to pack and headed out at 4am, a bit groggy, but excited for the Midwest section of the trip. Five hours later, we were able to make our first stop: the Old Courthouse. 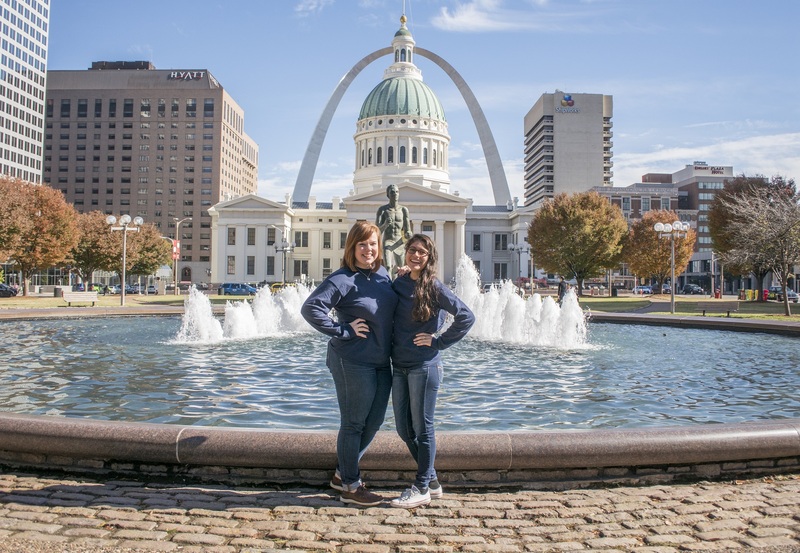 We were out on the road again until we reached St. Louis, Missouri where our first stop was the Old Courthouse. This courthouse is especially important because this is where the famous Dred Scott case was brought to trial. Dred Scott and his wife, Harriet, were slaves that filed a suit for their freedom against Irene Emerson, their slave owner. They tried to take advantage of the Missouri law that would allow them to buy their freedom, and after many years of hardship the judges finally came to a conclusion. In 1857, it was decided that they were not to be considered citizens of Missouri; therefore they could not sue for their freedom. Having grown tired of the slave family, the Emerson family sold them to the Blow family where the Scotts were finally set free. Sadly, Dred Scott enjoyed his freedom only for a short while as he died a year later in 1858. There is an exhibit in the Old Courthouse where the courtroom in which this trial was heard is displayed. It was filled with chairs for the jury, two desks for the attorneys, a desk for a bailiff, and a clerk, a chair for witnesses, and a chair for the presiding judge. We even recreated the trial ourselves! 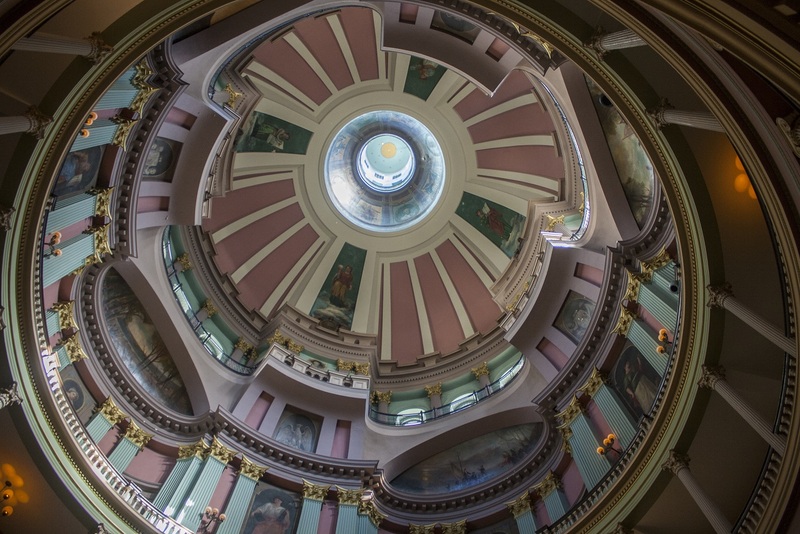 Apart from its historic value, the courthouse is a beautiful structure, with a beautiful dome designed by William Rumbold. As part of LEAP, we are always seeking ways to expand our knowledge. So it is only fitting that we visit the monumental symbol of the westward expansion as our next stop. The westward expansion, aided greatly by the Louisiana Purchase, doubled the size of the United States in 1803. 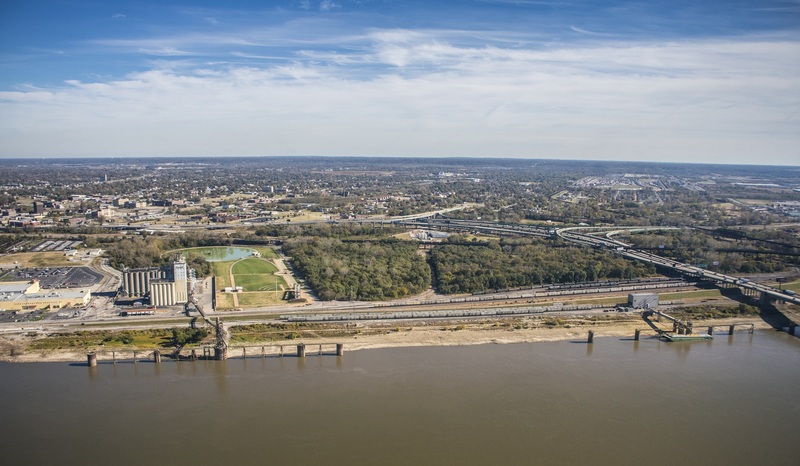 In honor of America moving into a more prosperous and hopeful state, The Arch was built as the “gateway to the west.” The Arch proudly stands at an intimidating 630 feet making it the tallest man-made monument in the nation. The architect, Eero Saarinen, was an immigrant from Finland and was granted this opportunity after winning a contest by the Jefferson National Expansion Memorial in 1947. After studying architecture at Yale, he believed this was the opportunity to establish himself as an architect in America and it was. Although the design for this structure was completed in 1947, the real structure was not completed until 1965! We learned that this monument was brilliantly made with 142 stainless steel triangle sections that are each 12 feet in length held together by tension bars and truss. It took 13 years to raise the 13 million dollars needed to fund this project. In 1967, a trans system was built inside the north and south legs of the arch allowing 40 people at a time to view the impressive view. It was through these same legs that we rode through in our capsules. 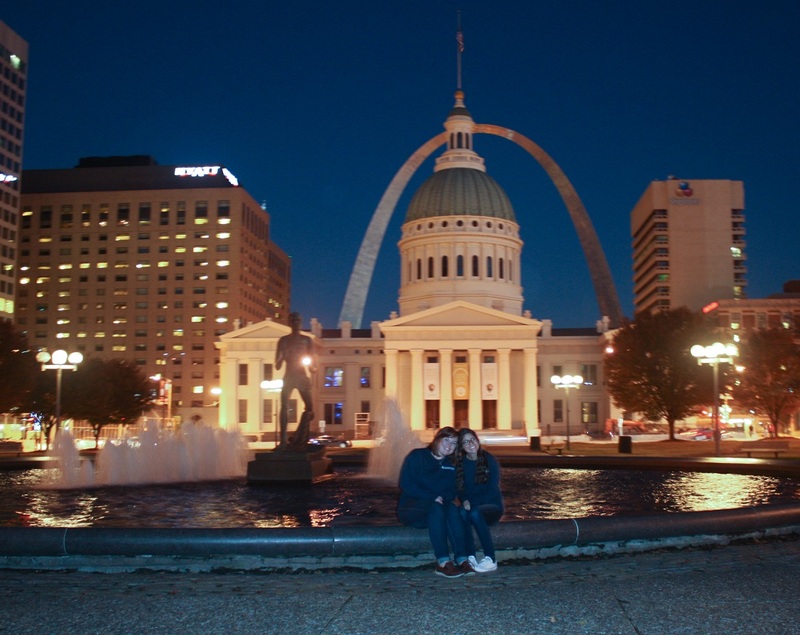 …and see parts of St. Louis that we looked forward to exploring. Once back on the ground, we were also able to watch an informative documentary about the arch and its history. Expansion in 1803 meant a hopeful future for some and that is our motivation as we expand our education in college and on our trips. 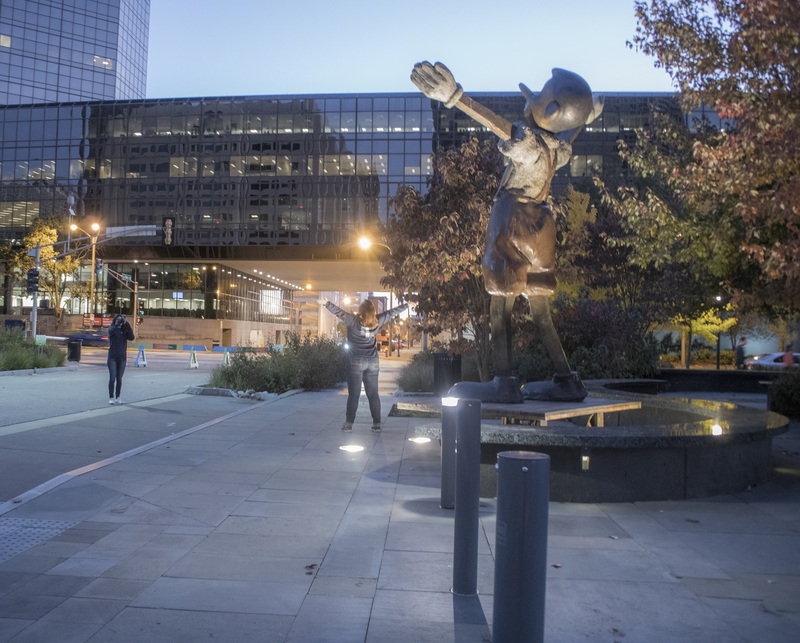 Originally, we had planned to visit the city garden that was near the courthouse. 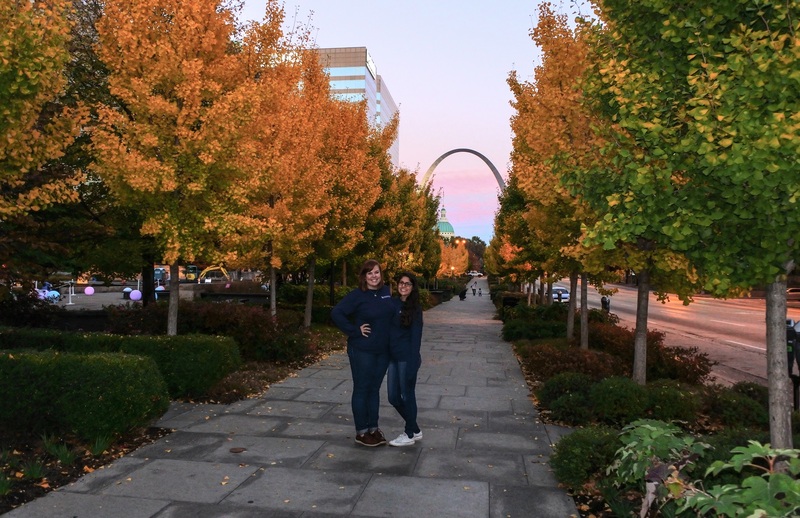 With its luscious greenery, sparkling fountains, and marvelous art we were all prepared to relax and enjoy the perfect view of the arch it would offer. Or so we imagined. Unfortunately, time didn’t permit a trip to that destination. 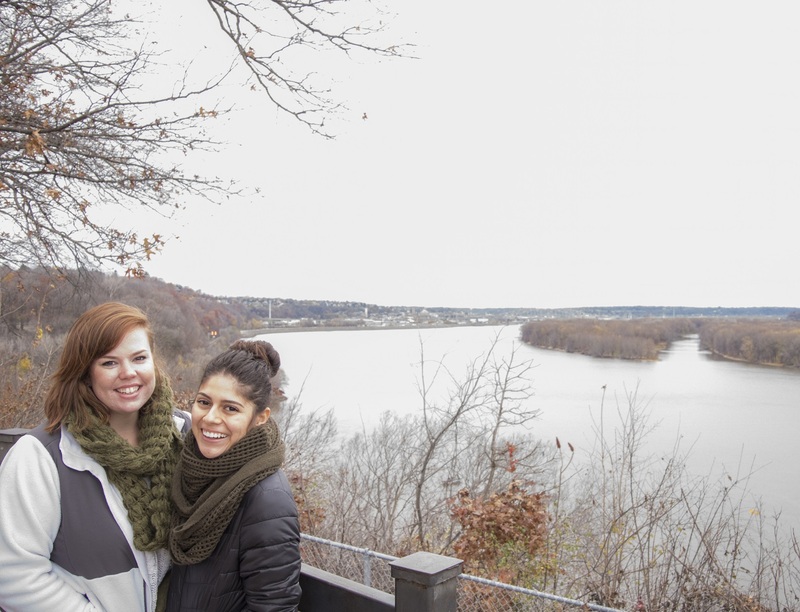 Remaining undaunted, we decided to go on a photo op adventure instead. 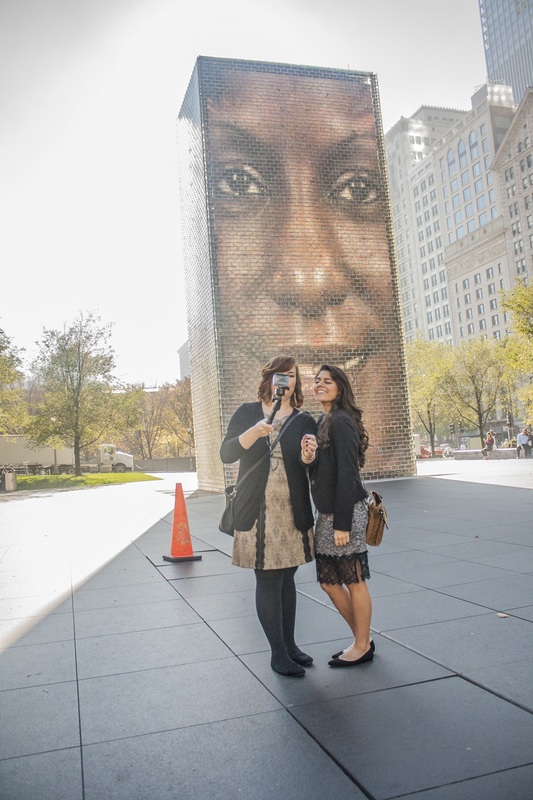 Our first photo op stop was a Richard Haas mural. 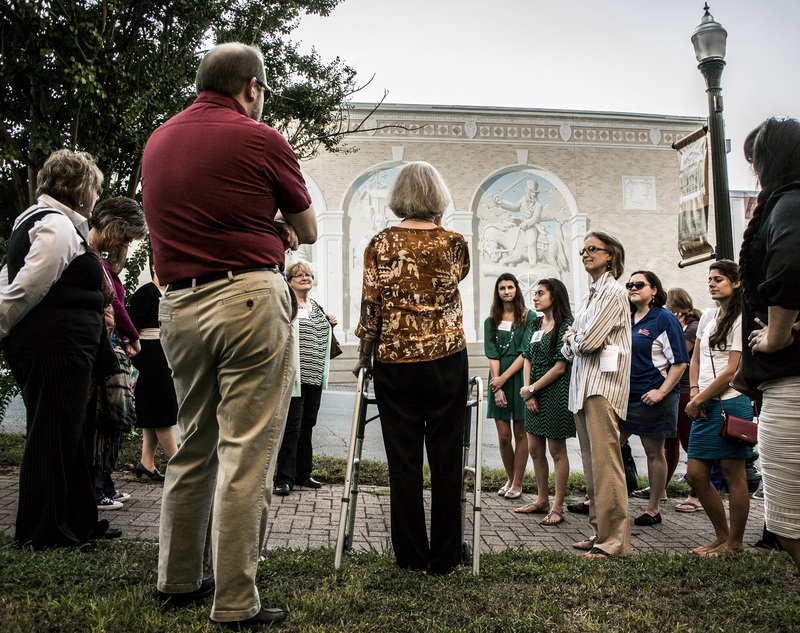 With two of our students having been interns at the Wynne Home, his work has a special meaning to us, and fourteen of his works dot the downtown of Huntsville. 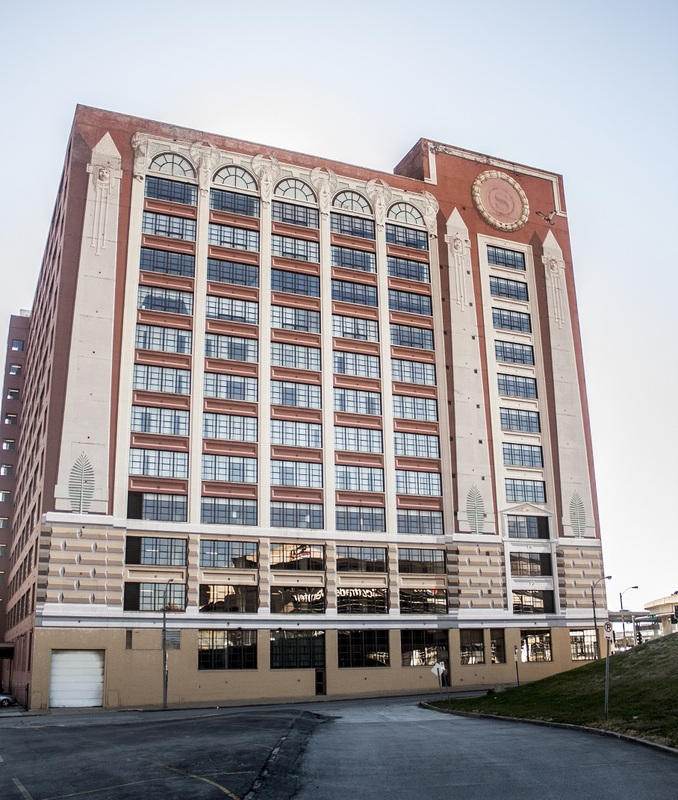 None of the ones in Huntsville, however, cover the 110,000 square feet of the one adorning the Old Edison Stores Building in St. Louis. …even the entrance to the bathrooms were interesting! But the grand hall was the most beautiful part. Across the street is the Milles Fountain, which is also impressive and offers a nice view of the exterior of the Union Station. 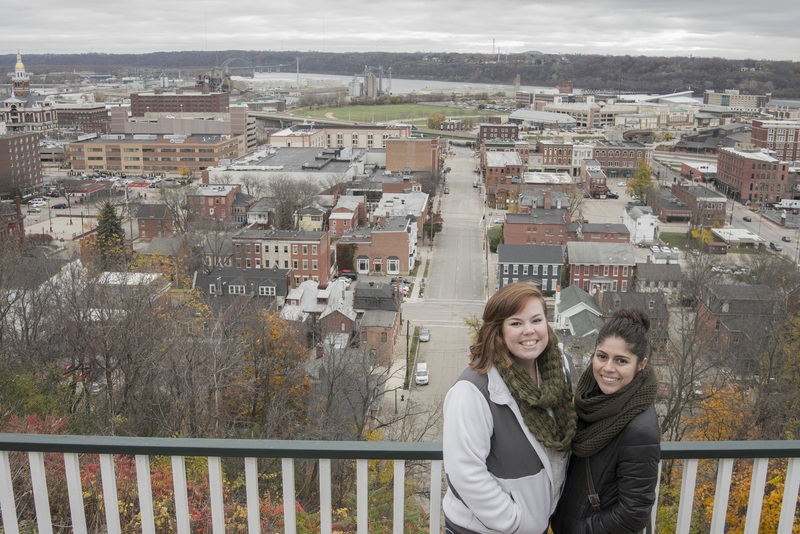 After a morning of westward exploration and photo ops in St. Louis, we took a quick stroll down The Hill to Amighetti’s. 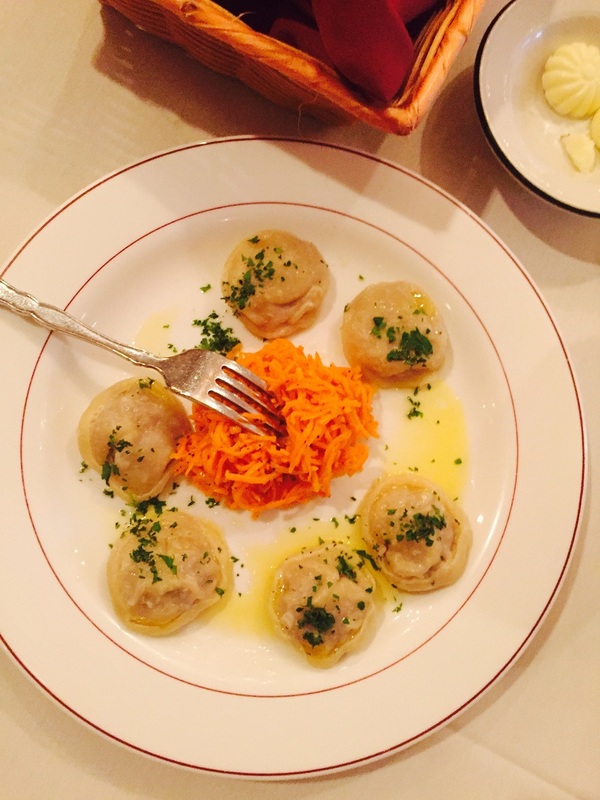 Located in what could be considered St. Louis’ Little Italy, the restaurant provided a prime venue for a satisfying lunch. Under what seemed an authentic tin-lined ceiling, we looked over the menu which included, but was not limited to, the Amighetti’s Special, a ravioli plate, and Little Bit of Italy sandwich. As for the Amighetti’s Special, the sandwich accomplished its main goal; completely stuff its eater. Made up of ham, roast beef, and Genoa salami, blanketed with a rich layer of brick cheese on a 9 inch loaf of French style bread, it was a near challenge to take a bite. However, the extra effort to open one’s jaw was worth it, for every bite was an opportunity to taste the delicious sandwich. To improve on the experience, the menu presented St. Louis’ own Ritz root-beer. The effervescent, sweet, and smooth root-beer was an enjoyable company to Amighetti’s Special. To close off our lunch we also ordered a round of gelato. Within the group we were able to enjoy a cup of a sour, but satisfying lemon ice, cherry peach, strawberry, and vanilla, all of which we considered of excellent taste. 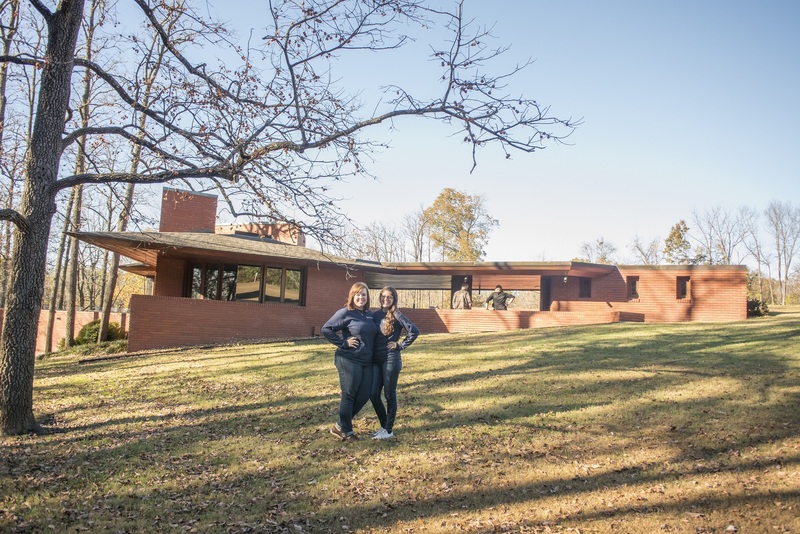 As we stood up from our seat, with a content belly and a cooled off palate, we regained the energy needed to continue our St. Louis exploration at the Frank Lloyd Wright’s Kraus Home. On previous adventures, Alex and Ryan had already encountered this one-of-a-kind home a numerous times. Therefore, Professor Yawn decided to give them the opportunity to explore new land by the name of the St. Louis Art Museum. After dropping them off we rerouted to the Kraus home. Hidden behind lush greenery, Frank Lloyd Wright’s Kraus Home is located in the upscale Kirkwood neighborhood of Saint Louis. Taking a short drive from the art museum, we arrived for a special tour. Normally, tours are not available on Wednesday afternoons, but the staff of the home were generous enough to arrange a tour for us today! Upon arrival, we immediately gaped in awe of the unique architecture and the natural beauty surrounding the home. To begin our tour, we watched an introductory video about the Kraus home and its architect. Frank Lloyd Wright was born in 1867 and designed more than 500 structures throughout the United States. Represented in the Kraus home were parallelograms, hexagons, and horizontal lines, all of which accentuated the Usonian vision of Wright. The Kraus home sits on 10.5 acres of land now owned by Saint Louis County as part of its parks system. In the mid 1940’s, Russell Kraus, a Frank Lloyd Wright enthusiast, wrote to Frank Lloyd Wright requesting him to design a small and less expensive home. Nearly ten years later in 1955, the home would finally reach completion. 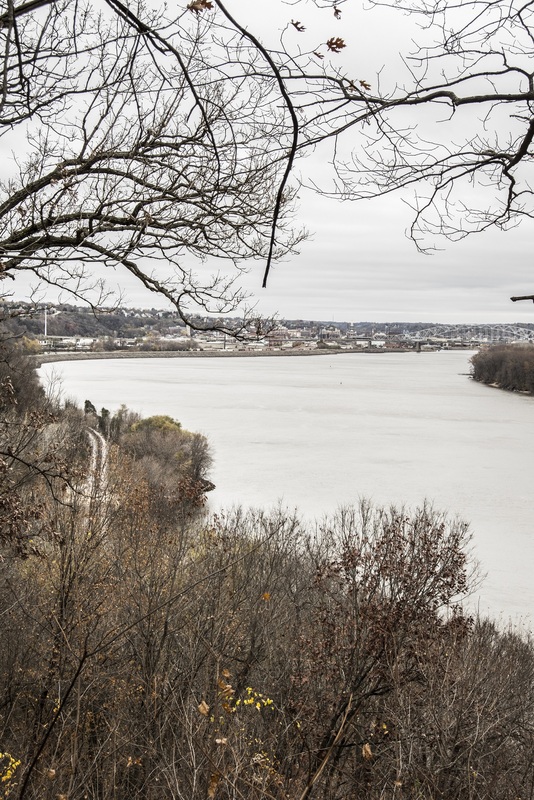 Mr. Kraus lived there until 2001, when a non-profit raised money to purchase the home and the land was deeded to Saint Louis County. 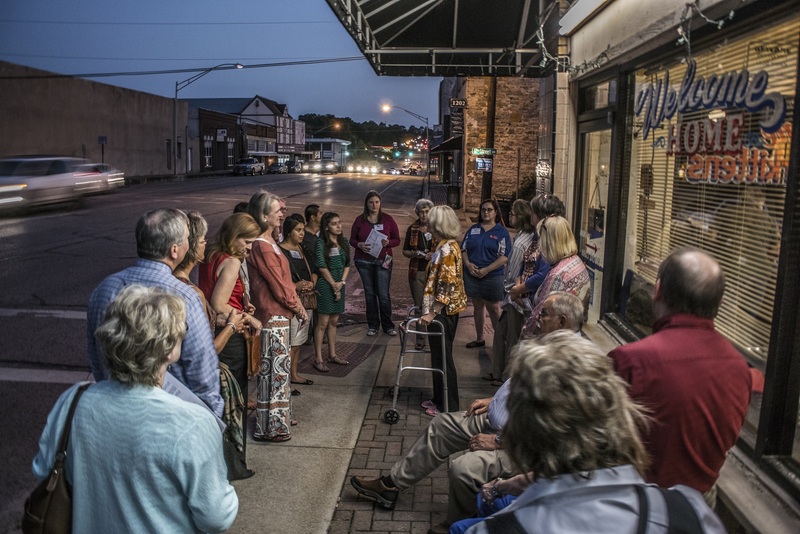 Throughout the tour, Professor Yawn was quick to point out the horizontal attributes of the home, noting even the grooves between the brick walls were designed to draw the eye horizontally instead of vertically. The Kraus home was designed as two hexagons partially overlapping one another. The entire home is made up of these two hexagons or its subcomponents (parallelograms and triangles). Even the bed, for example, is a parallelogram. Meanwhile, in the St. Louis Art Museum, Ryan and Alex were being exposed to various forms of art. 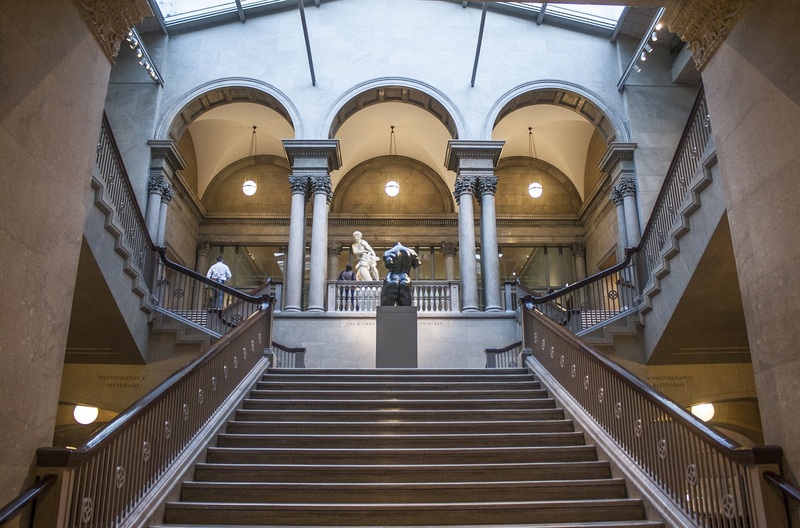 …Degas, Rodin, Kandinsky, Warhol, Segal, O’Keeffe, and many more. Outside, there was a short path through a small sculpture garden, mostly made up of pieces from Henry Moore. 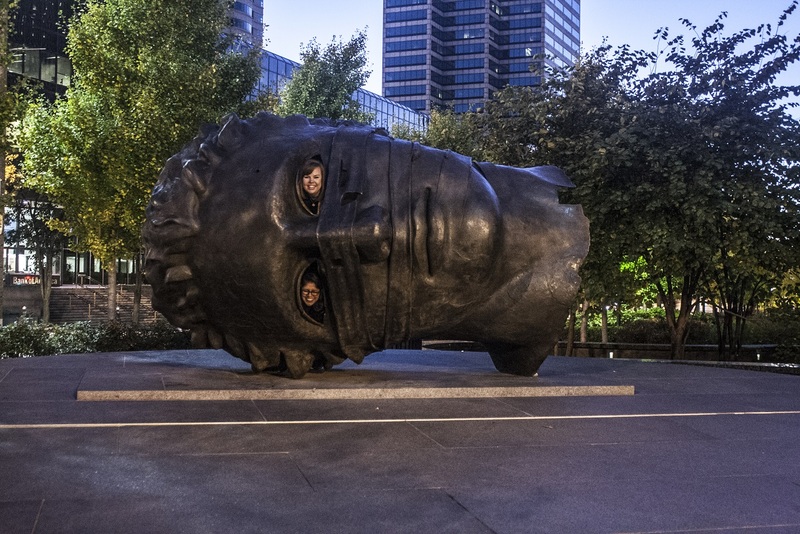 As we were leaving, a huge storm rolled in, cutting out our trip to a sculpture garden in the downtown area. So instead, we headed towards Bentonville, stopping for a photo-op at the world’s largest fork, and afterwards, stopping for dinner. …Springfield appropriately offers numerous eateries from which to choose. We choose Cafe Cusco, a Peruvian restaurant that has all the attributes of good Peruvian food, without the risk of Zika. With the buildings soaking in the last rays of the day on Commercial St., we crossed the threshold into the Peruvian cuisine restaurant. As Peruvian folk music sounded its harmonious guitar in the background, we looked through the menu. With a variety of “platos” or dishes, from vegan salads to meaty steaks, the appetite of some of us were attracted to the fried rabbit, fajita saltada, BBQ pork panca, and lomo saltado. First, however, we began our taste of Peru with a seafood dip and fried avocado appetizer. As the initial dishes were cleared, we readied ourselves for our main course. Soon the table was enveloped in the spicy aromas of the various dishes. As for the lomo saltado, a dish of steak cooked with bell pepper and onions served with fries and rice, each scoop of the fork brought to one’s mouth the zesty spice of Peruvian flavor. Perhaps the best of the dishes, however, was the rabbit, which Ryan enjoyed immensely. 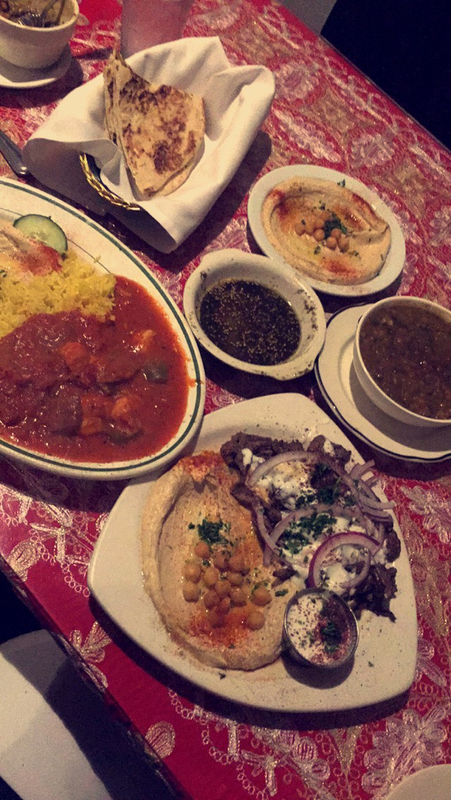 In all, the restaurant was more than enough to make us go back to the corner block venue as we were forever in love with these flavorful dishes. For the meantime however, it was time get back to our traveling van for we still had half a state left to ride through. We left Madison bright and early this morning to get a head start on the day’s heavy amount of driving. Before completely departing the capitol, however, we stopped by a “lost” Richard Haas mural. 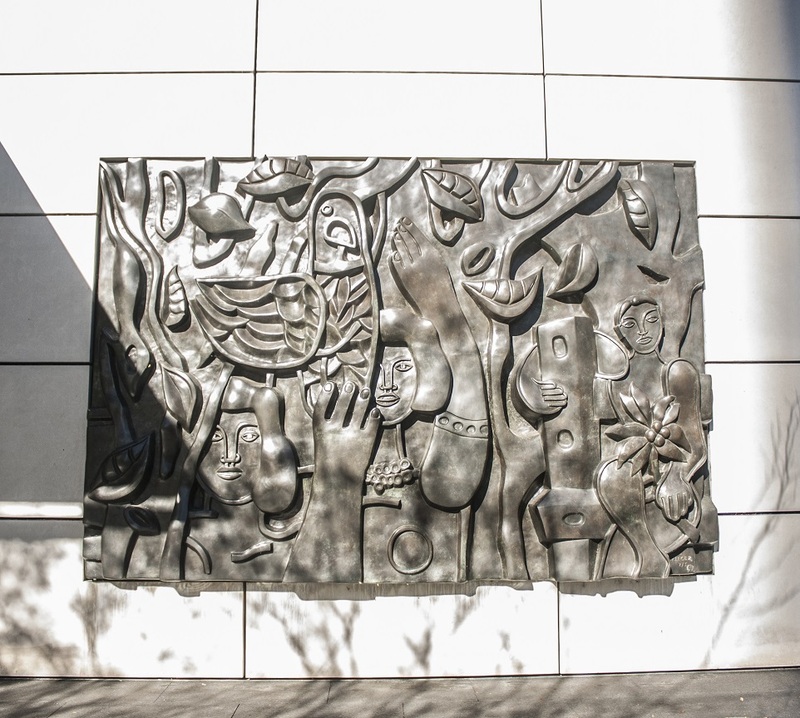 Haas completed this mural in 1987 and it beautified an already beautiful city for almost a decade. In the 1990s, however, Madison decided to revive a Frank Lloyd Wright design for the City–Monona Terrace. 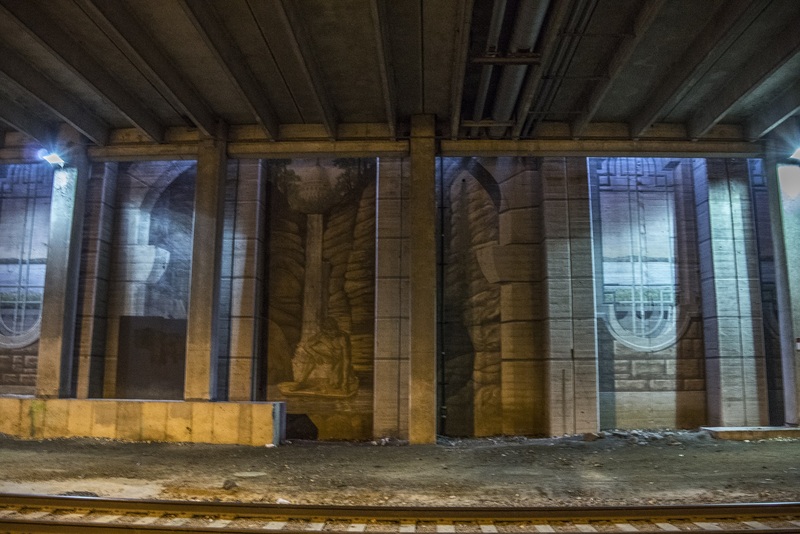 In completing the Wright design, the Haas mural was relegated to the side of a tunnel wall. 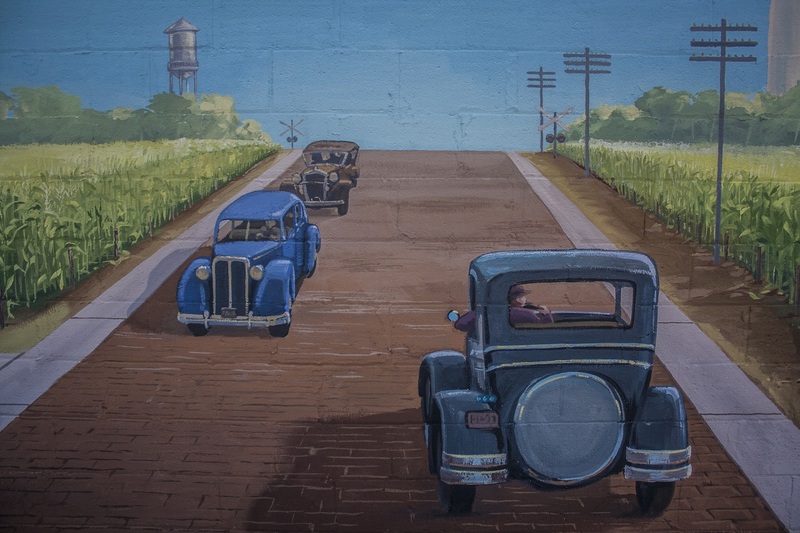 Not made to be seen in tunnel, and obscured by newly installed load-bearing columns for the overpass, the Haas mural of Wisconsin’s history is all but destroyed. Still, we discovered vestiges of it. With that sad sight in mind, we began the winding drive to Dubuque, Iowa. 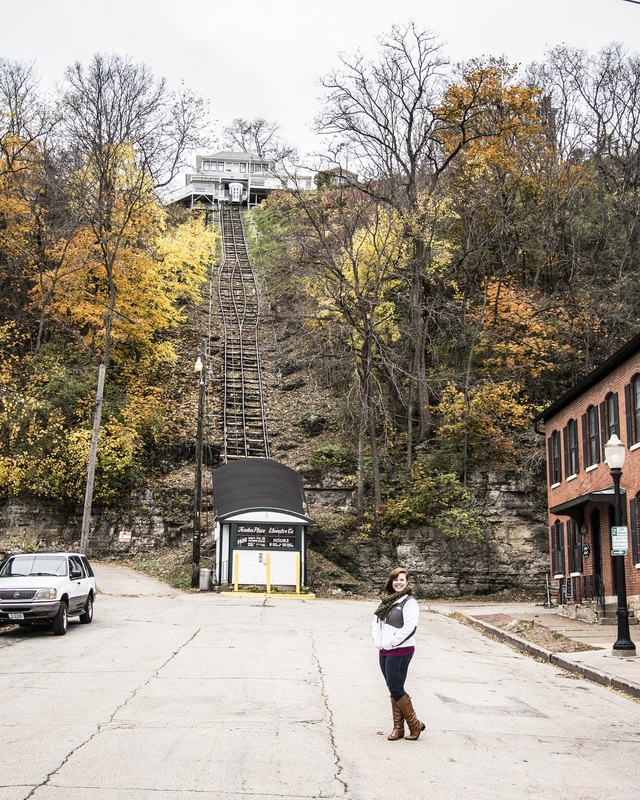 Dubuque, a small town along the Mississippi, was founded in 1833 and is home to an incline that gives panoramic views of the surrounding area. 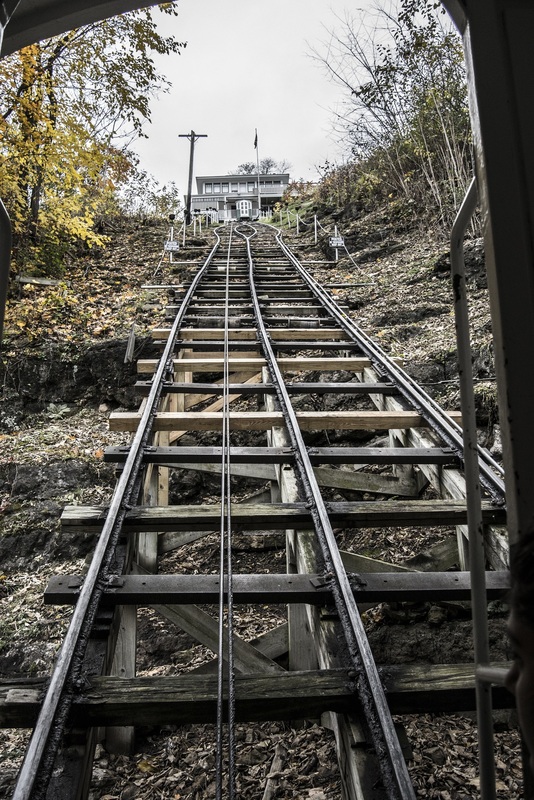 We arrived at the bottom of the incline, nervous (editor’s note: mostly Constance was nervous) about the rickety tram that would take us up the steep embankment. We piled in, however nervous we may have been, and slowly made it up the hill. …and to see how far we had come up the mountain. 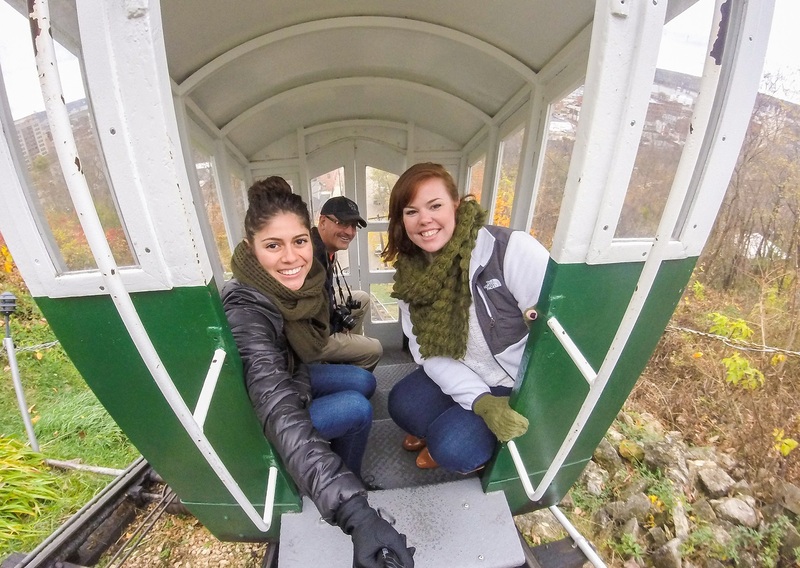 After a couple pictures, we rode down in the tram once more to find solace in the warmth of the minivan. By the end, we (Constance, especially) were proud of the trip up and back! We then drove to the gravesite of Dubuque’s founding father, Julien Dubuque. 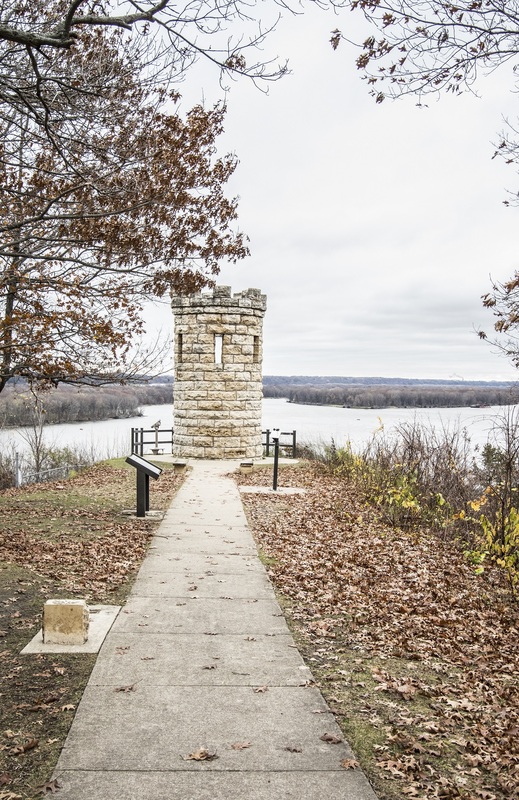 The grave, memorialized by a turret-like structure, sits on the edge of a mountain along the Mississippi. 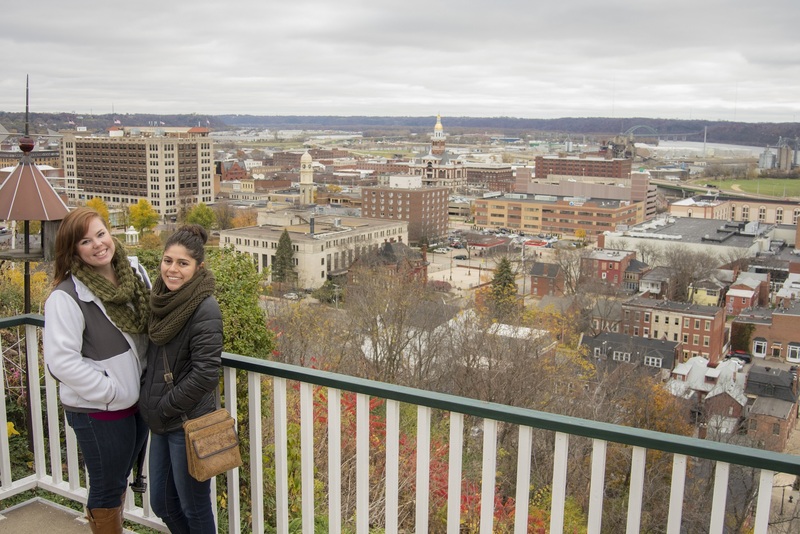 We braved the semi-cold to appreciate the view of Dubuque and the fall colors of the area. 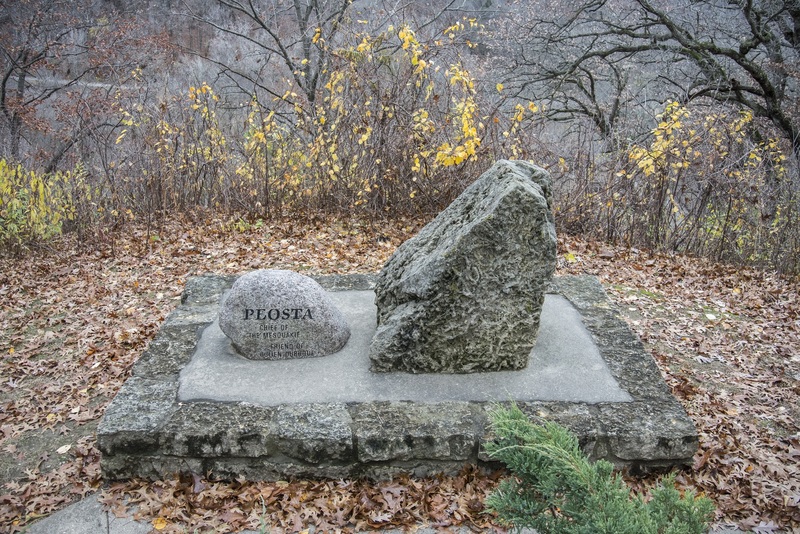 Dubuque, who maintained a healthy relationship with the local Native American tribe, rests near the grave of Chief Peosta’s, leader of the Meskwaki tribe (and Dubuque’s father-in-law). …and then headed back to the car for our next stop. After a few hours, we stopped for lunch at Her Soup Kitchen. A small, local eatery, the restaurant boasts local, fresh ingredients, which we enjoyed immensely. 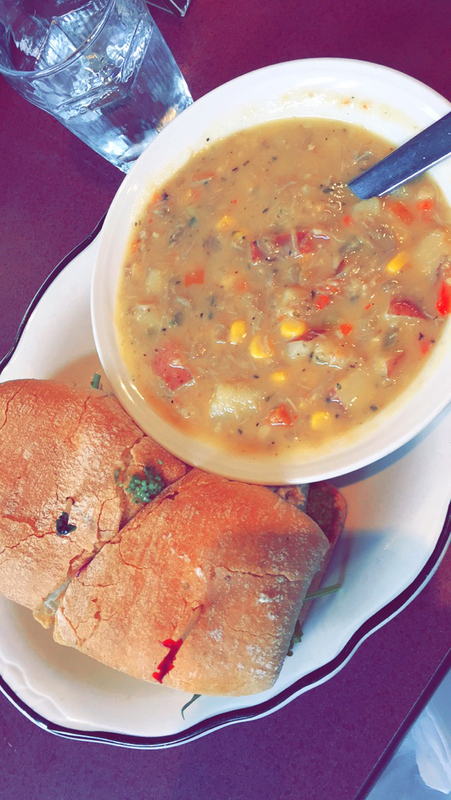 The cold weather made the soup even more delectable, as we warmed up from the inside, out. 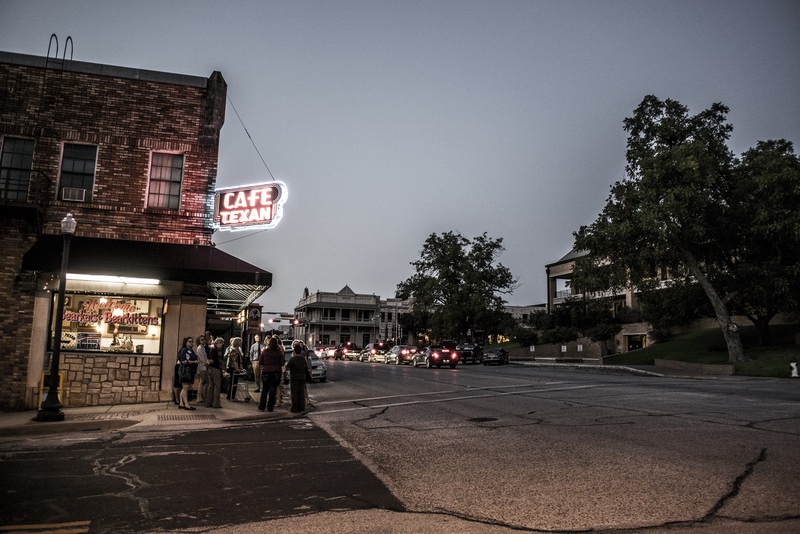 It was a neat place to eat, and we hope that the place thrives! 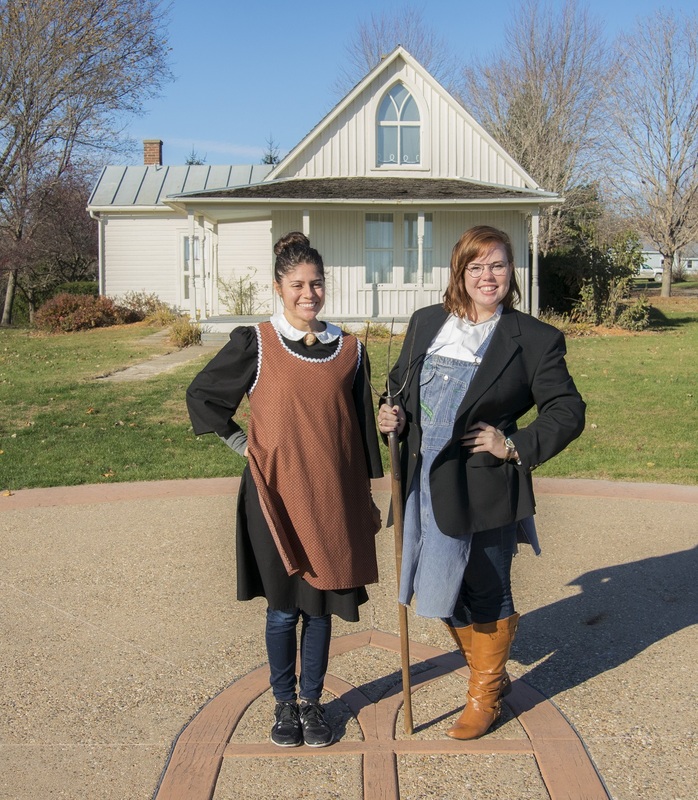 With a warm midwestern meal in our stomachs, we headed to not only an icon of the midwest, but an icon of the American scene: The American Gothic house. …and this made visiting the home all the more rewarding. 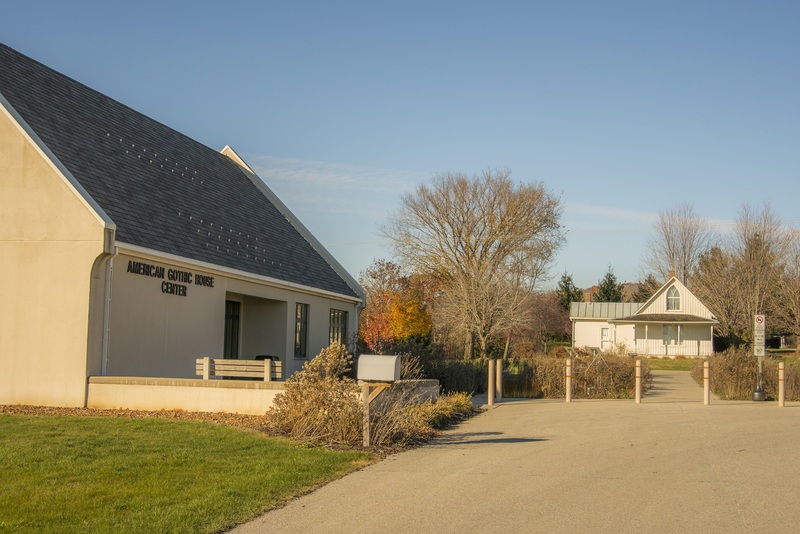 Although it rests in a small town, a visitor’s center and Grant Wood museum accompany the site of the home. We walked in and promptly began putting on costumes to impersonate the couple in the photo. Once dressed, we posed in front of the home with the most convincing faces we could muster up which seemed a harder task than once originally expected! Switching costumes, we continued the photo opportunity in opposite outfits but still finding it difficult to portray the seriousness Wood intended. 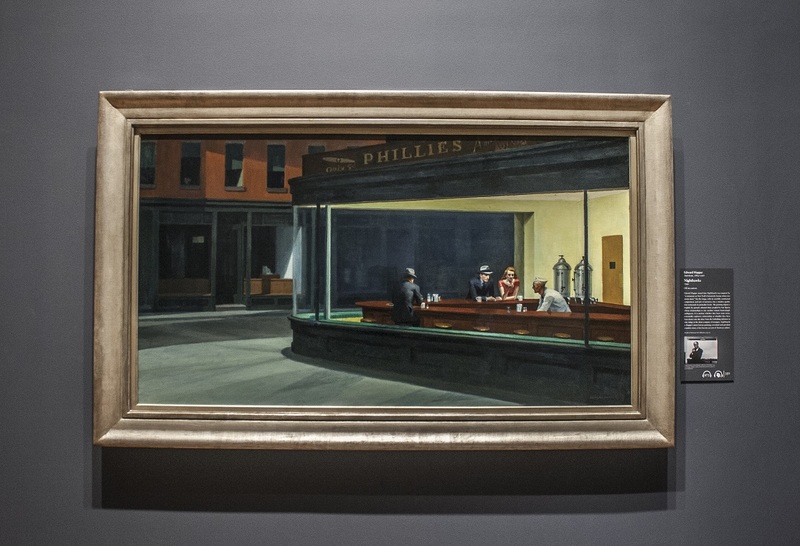 All silliness aside, it was exciting being able to reenact history after seeing the original painting in Chicago. We headed inside to the museum to learn a bit more about the artist himself. Born in 1891 in Anamosa, Iowa, Mr. Wood lived a very interesting life. 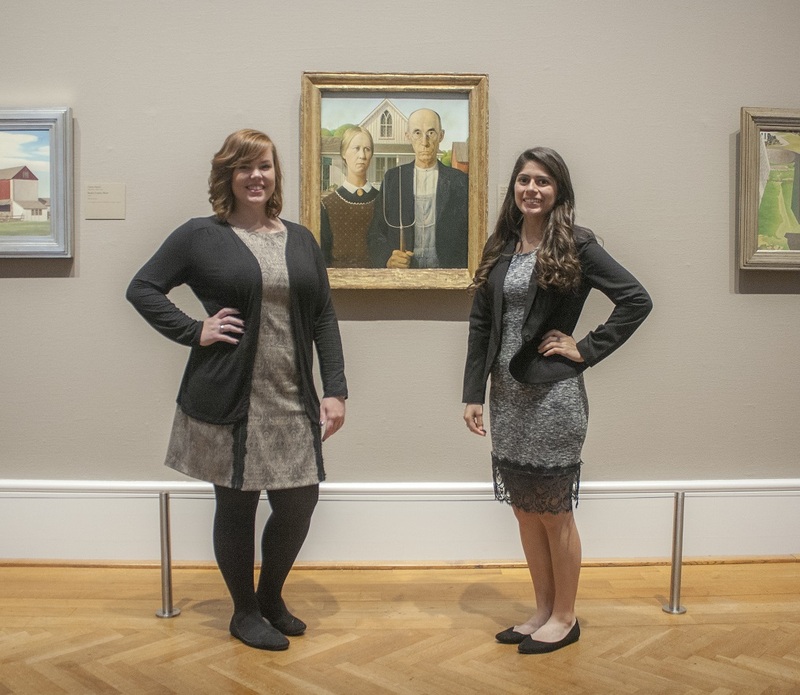 A teacher, soldier, and artist at last, Grant Wood studied impressionism and post-impressionism in Europe and became the artist we know today under these occupations. 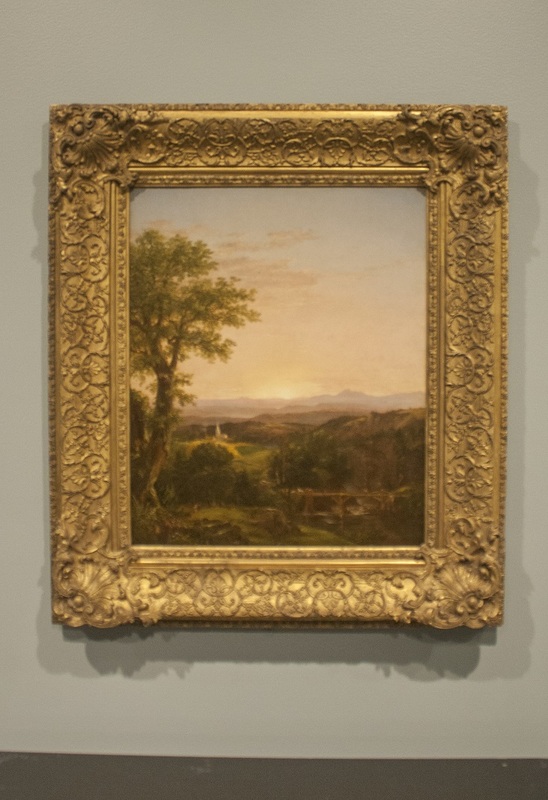 Friend of Thomas Hart Benton and John Steuart Curry, Wood practiced the art of Regionalism with his colleagues, whom we have also had the chance of viewing at other museums this trip. 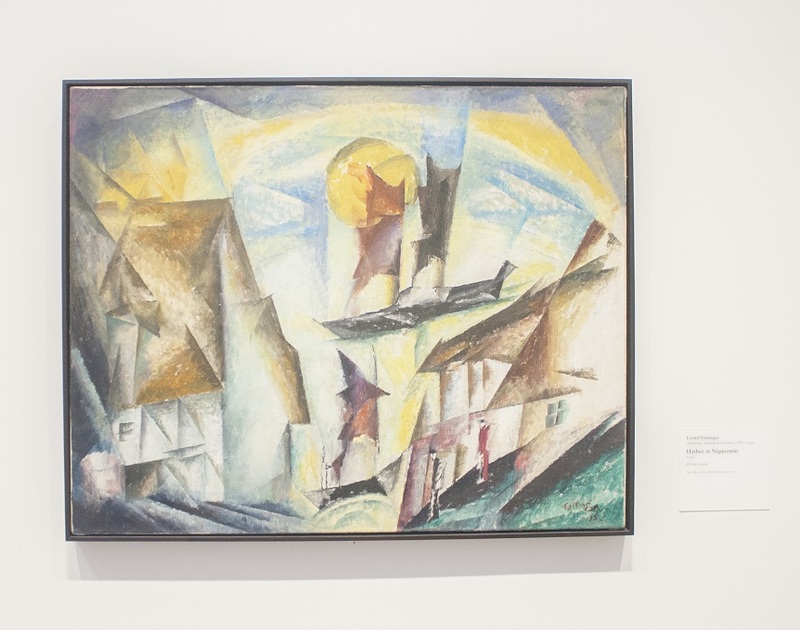 Although posthumously famous, Wood lived a fairly middle-class life and supported his hometown through the Great Depression by opening the Stone City Art Colony. He married, divorced, and died one day away from fifty-one from pancreatic cancer. We left a bit more knowledgeable about the artist and having enjoyed the driving break, got back on the road to finish the drive to Kansas City. 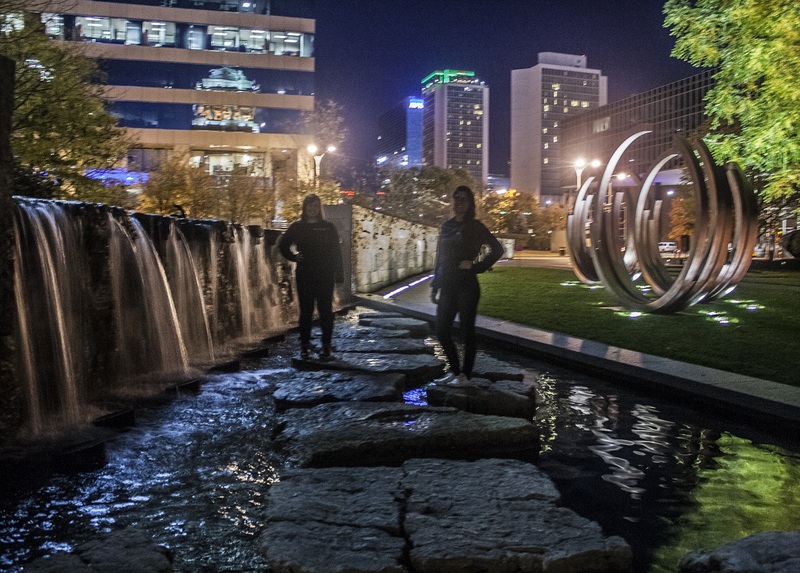 Once we arrived in Kansas City, we took advantage of the late closing hours of the Kemper Museum of Contemporary Art and The Nelson-Atkins Art Museum. 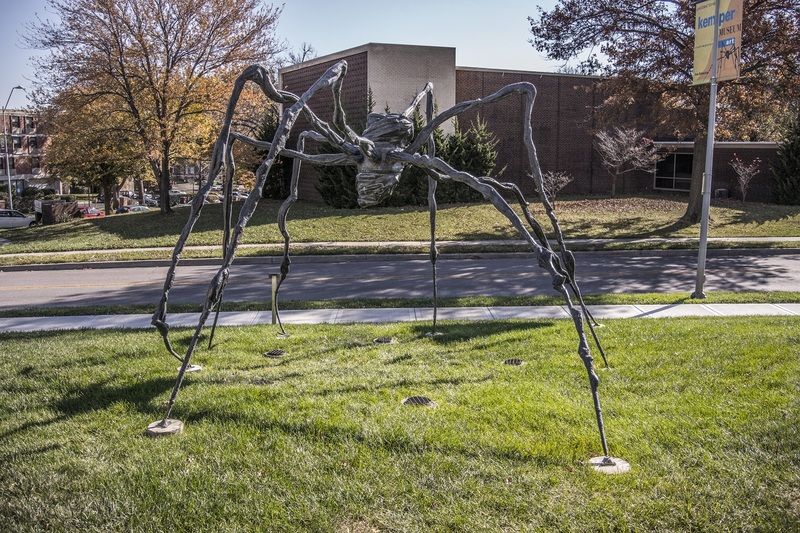 While walking up to the Kemper Museum of Contemporary Art we were greeted by one of Louise Bourgeois famous giant spider sculptures. 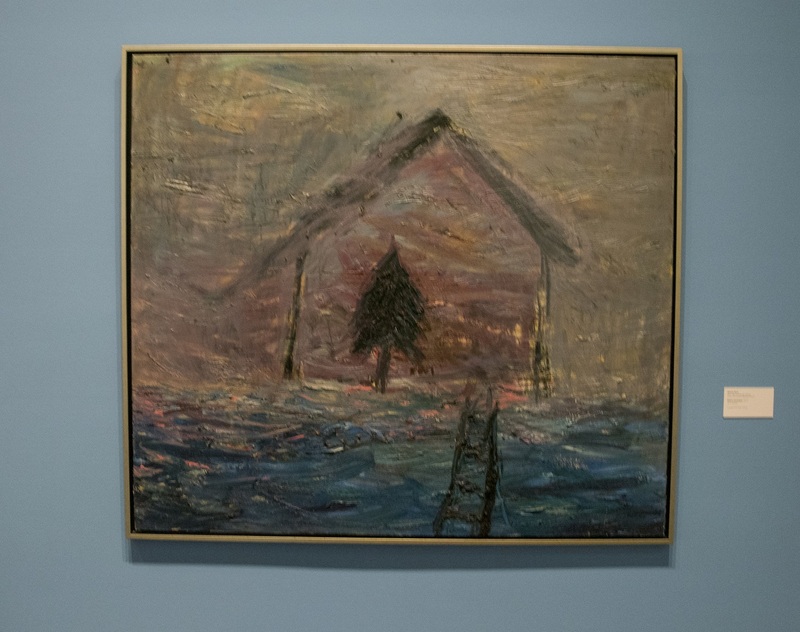 The Kemper Museum of Contemporary Art had a “Dark Days, Bright Nights: Contemporary Paintings from Finland” exhibition while we were there that had a dark motif. As we walked through the temporary exhibit we had some group favorites such as “Canary” by Vesa-Pekka Rannikko ,which used ropes to complete its illusion. Another group favorite was “Cottage” by Nanna Susi. 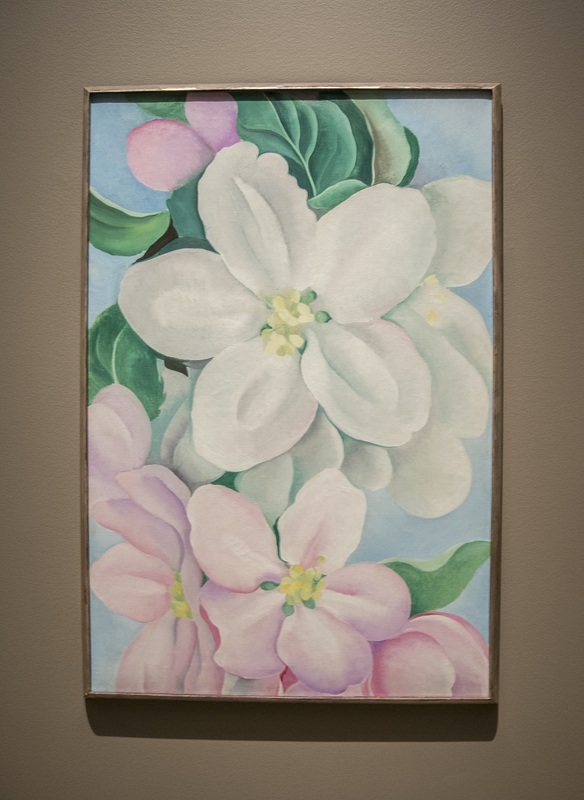 Constance was pleased to see one of Georgia O’Keefe’s early paintings as well. 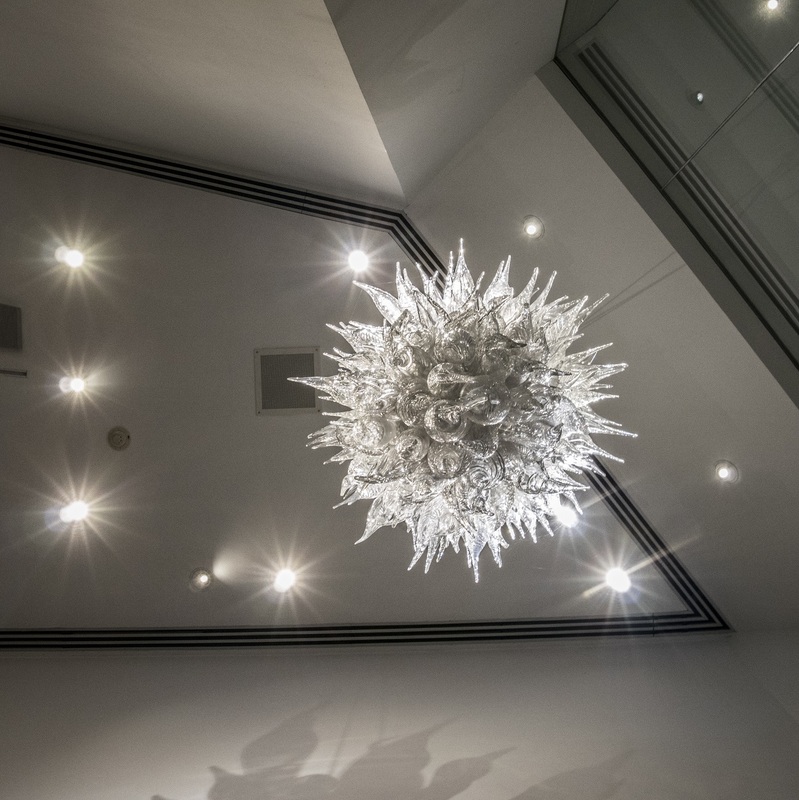 I think that the highlight of the museum was the two Dale Chihuly pieces that were on displays at the Kemper Museum of contemporary Art. and another titled “Autumn Trees”. 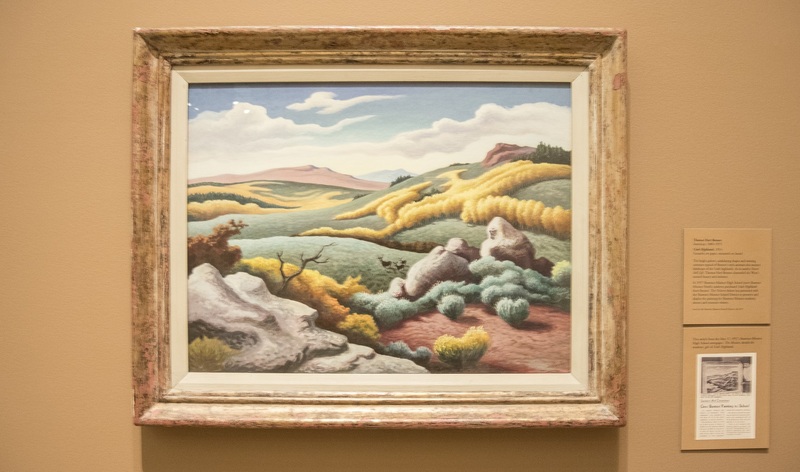 One of Professor Yawn’s favored pieces included “Utah Highlands” painted by Thomas Hart Benton. We also found an interesting transformation piece in the Asian art gallery that showed a mountainside changing seasons. 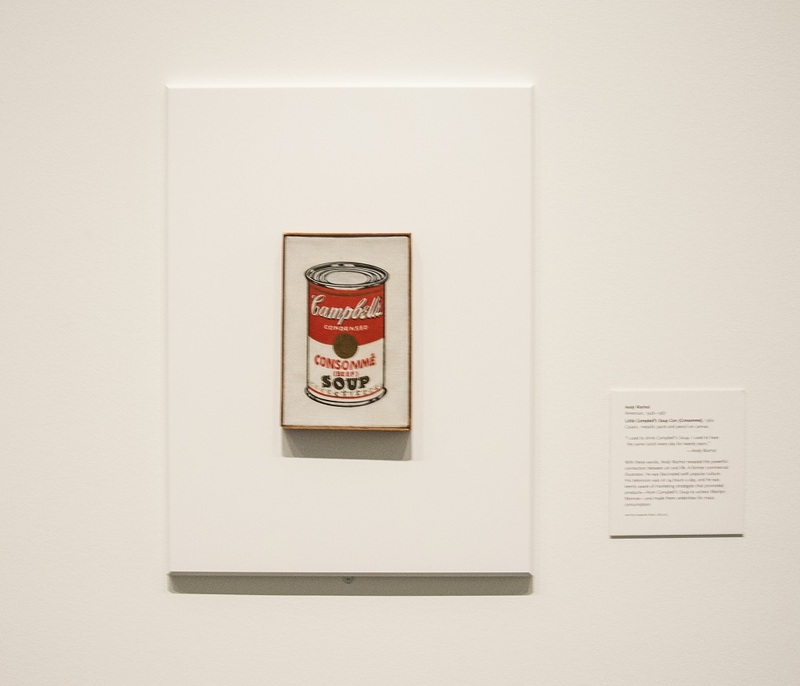 We ended our self-guided tour of the museum in the Contemporary Art gallery where we saw Andy Warhol’s very famous “Campbell’s Soup Can” along with other interesting pieces. Hungry, we raced down to Grunauer for dinner. 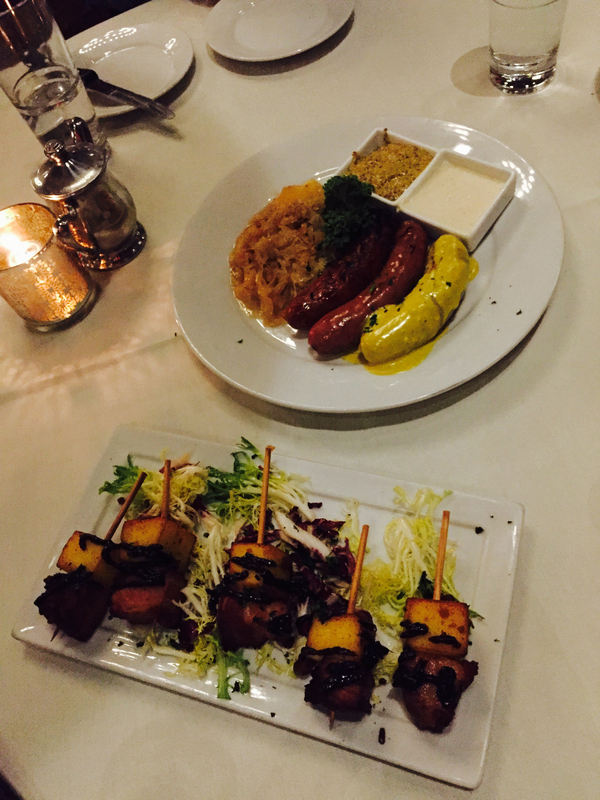 We tried three different sausages and some pork belly before our main course. Constance and I shared the A la Grunauer Schnitzel. 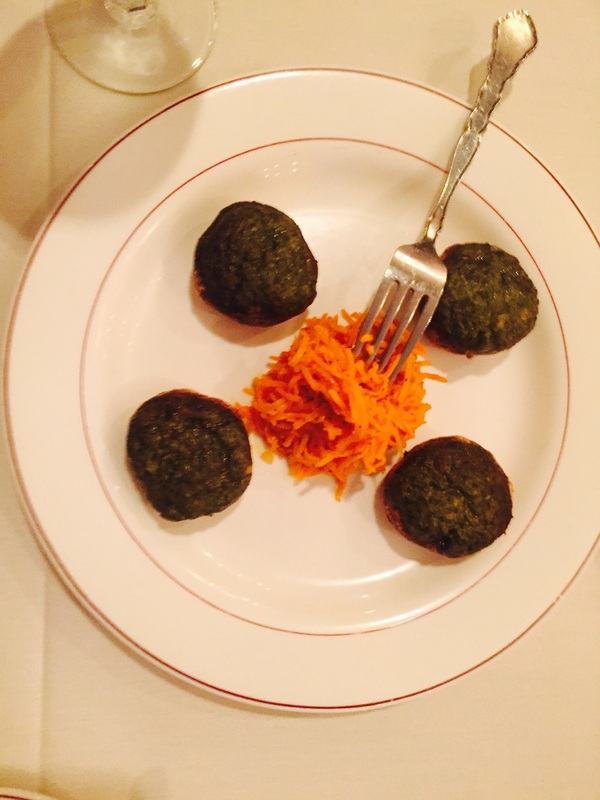 The schnitzel was breaded pork stuffed with creamed spinach, and tasted amazing. 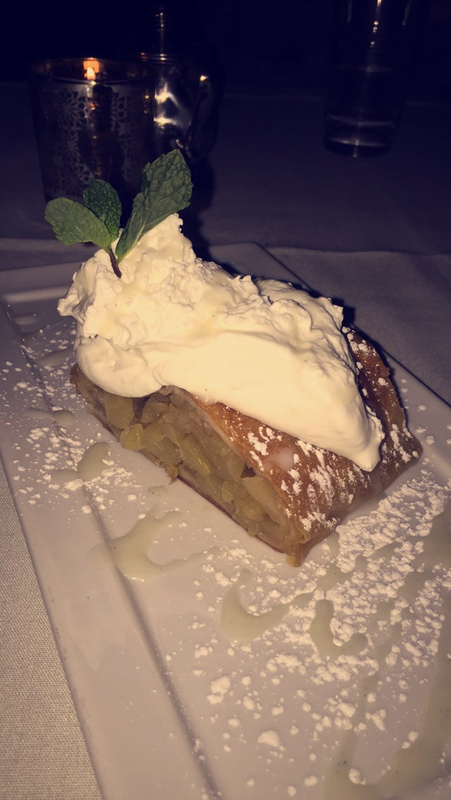 Our entrees were delicious and we ended our dinner with an apple strudel. 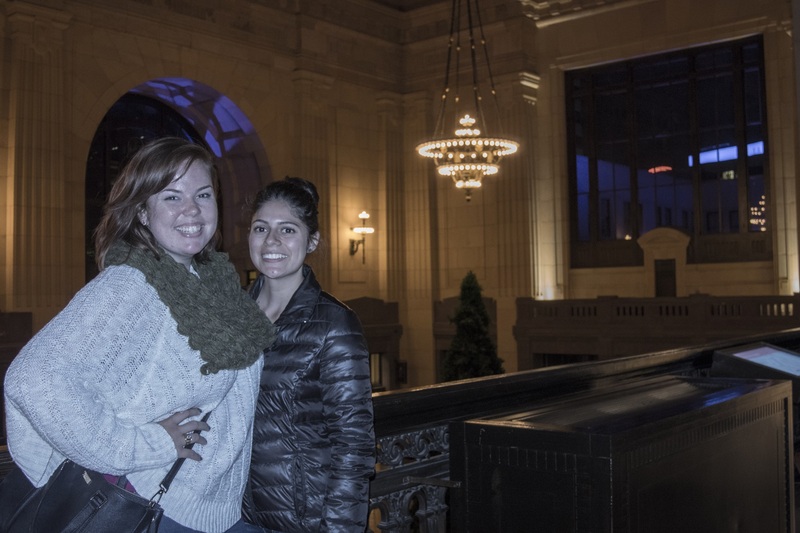 After an amazing and very filling dinner, we walked over to Union Station. We were able to stand on one of the walking bridges just in time for the train to speed right below us. 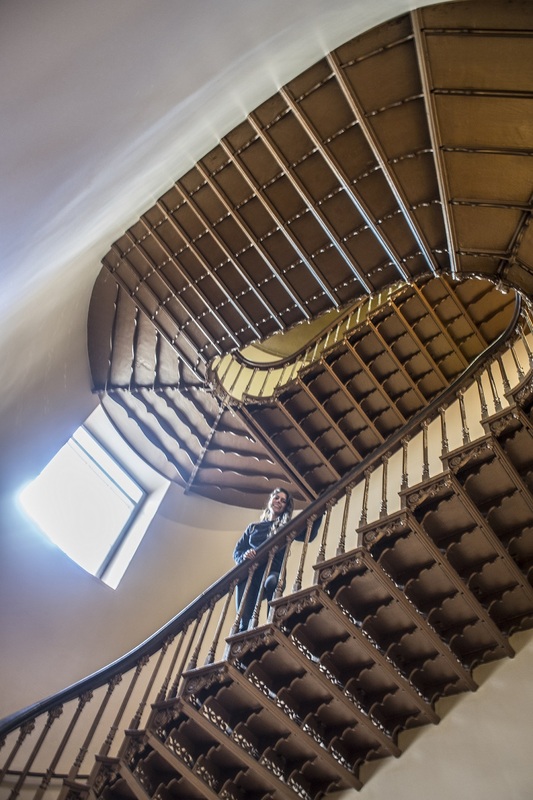 After exploring and taking a few pictures in the beautiful building, we were ready for a good nights rest so that we could start our morning bright and early. 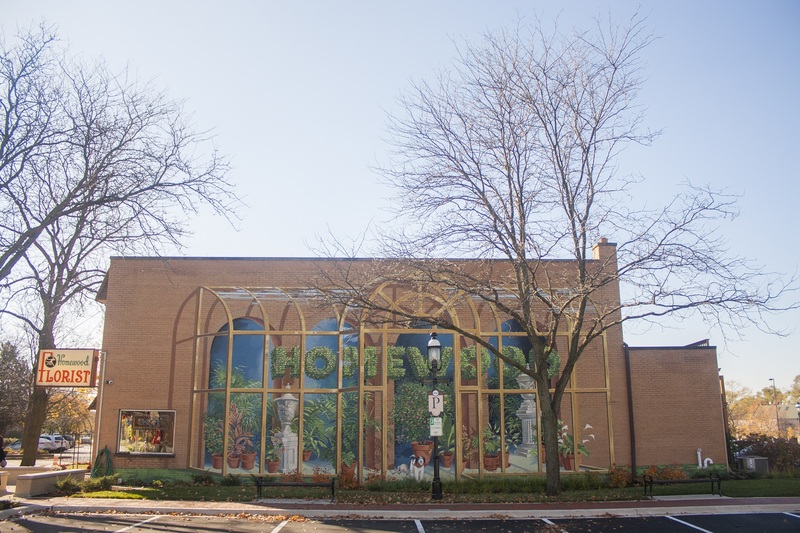 We began our morning with a trip to the village of Homewood, Illinois to check out their Richard Haas murals. 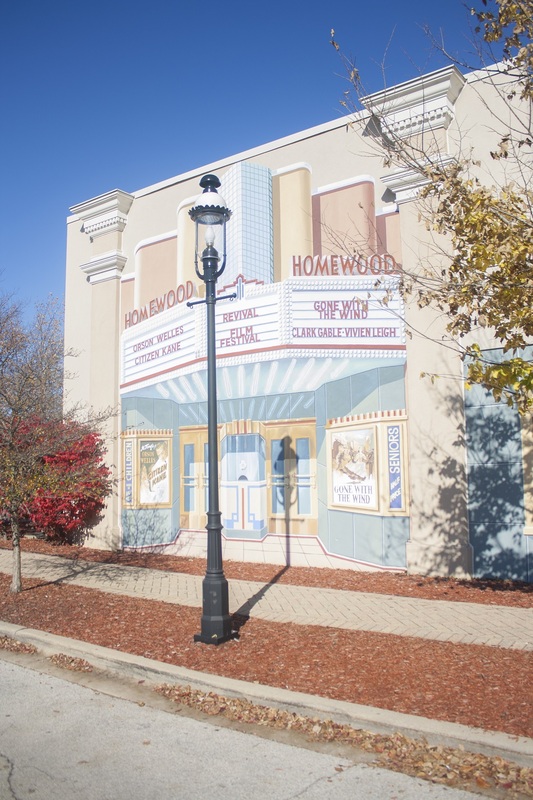 Although Huntsville boasts the largest collection of his murals (14), we were excited to find 13 murals that call Homewood home. 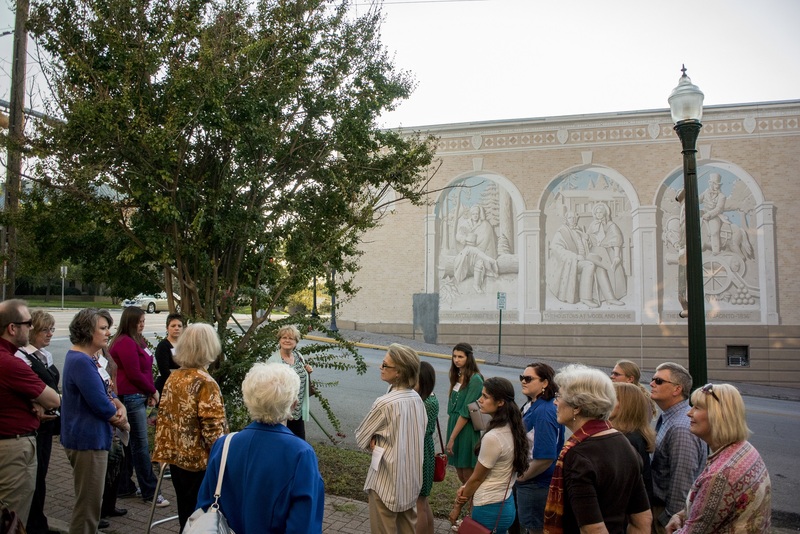 Arriving in the quaint village, we parked and excitedly began our scavenger hunt for the elusive, illusive murals. The first we found clung to the wall of a florist’s shop, a greenhouse to accompany the business’ theme. Moving on, we came across a theater, paying homage to the original theater and marquee formerly found in Homewood. 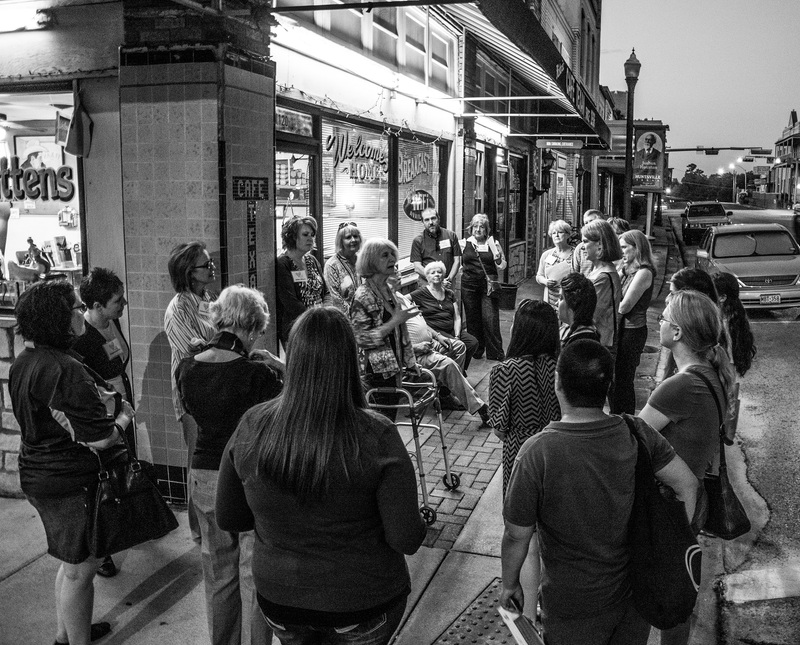 Interestingly, the theater’s “Coming Attractions” involve at least one film involving Chicago, “Some Like it Hot,” which the LEAP Center used as its centerpiece for our Marilyn Monroe Film Festival. and finally, an extensive mural on the history of the bicycle. 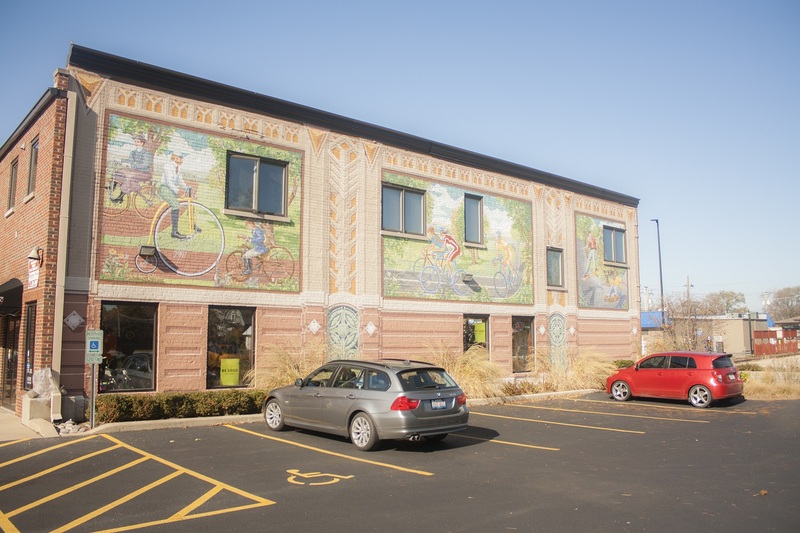 With the hunt for his thirteen murals complete, we hopped in the car to commute to downtown Chicago. 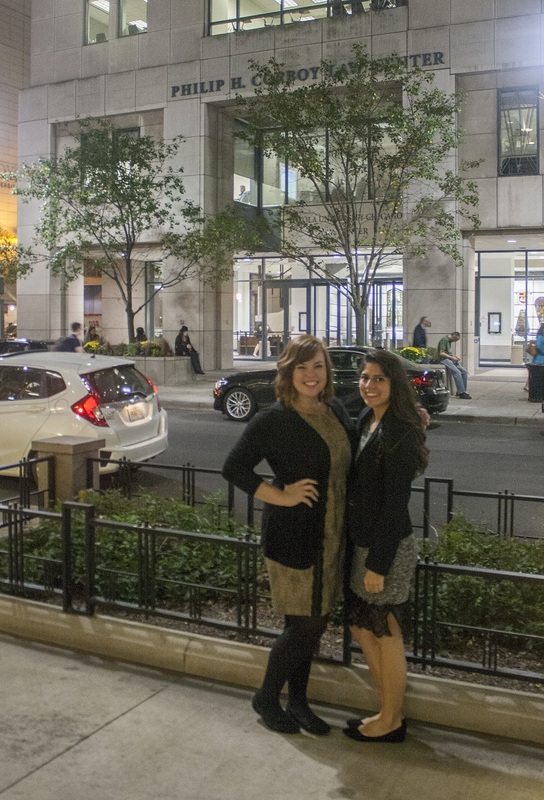 Parking was a challenge, but we found a central location. 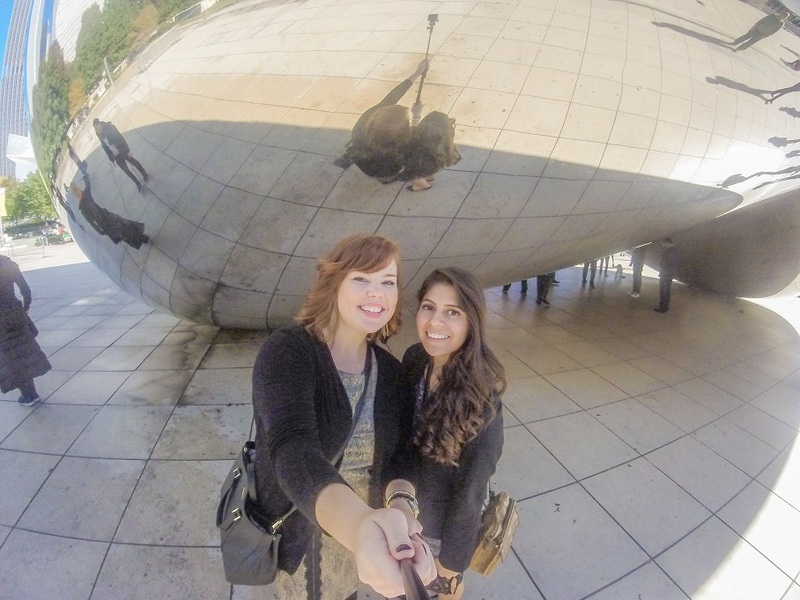 We ventured into the very busy Chicago streets and made our way to Millennium Park, where the very famous public sculpture “Cloud Gate” (a.k.a., “The Bean”) is located. She wasn’t the only one in the series. Others also jumped for joy. …we made our way down to the Chicago Architecture Foundation shop. 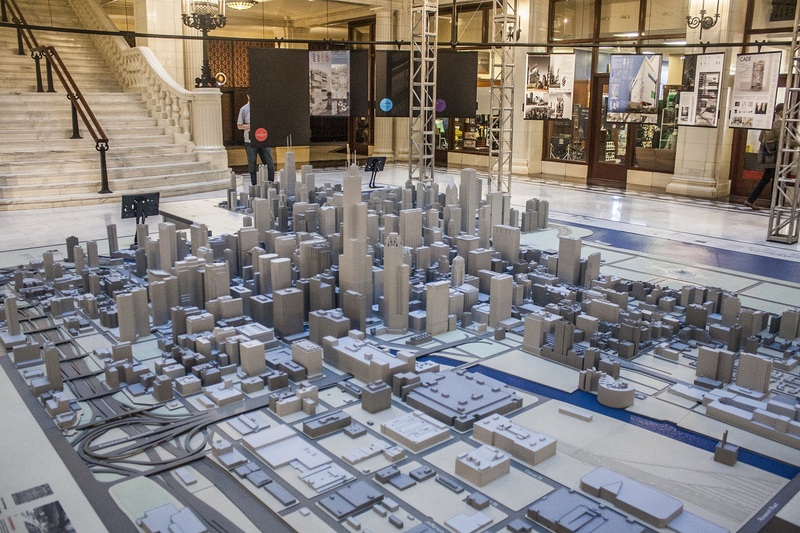 We were welcomed by souvenirs of an architect with whom we are all familiar, Frank Lloyd Wright–as well as an intriguing model of Chicago. 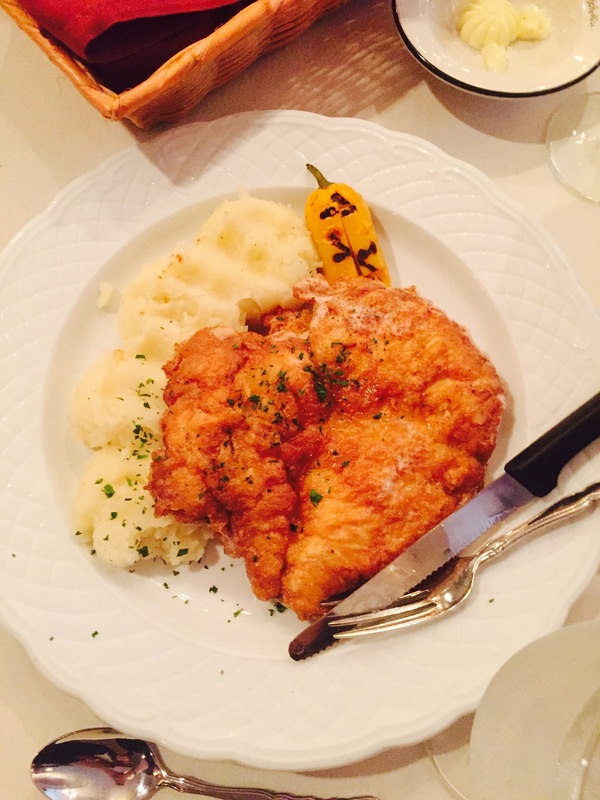 …and our shared Chicken Duran Schnitzel entrée. The food was wonderful. We look forward to the opportunity of comparing the Russian schnitzel with the Austrian variety we will try at Grunauer’s in Kansas City in a few days. Stuffed, we walked off a bit of our lunch en route to the Chicago Institute of Art. 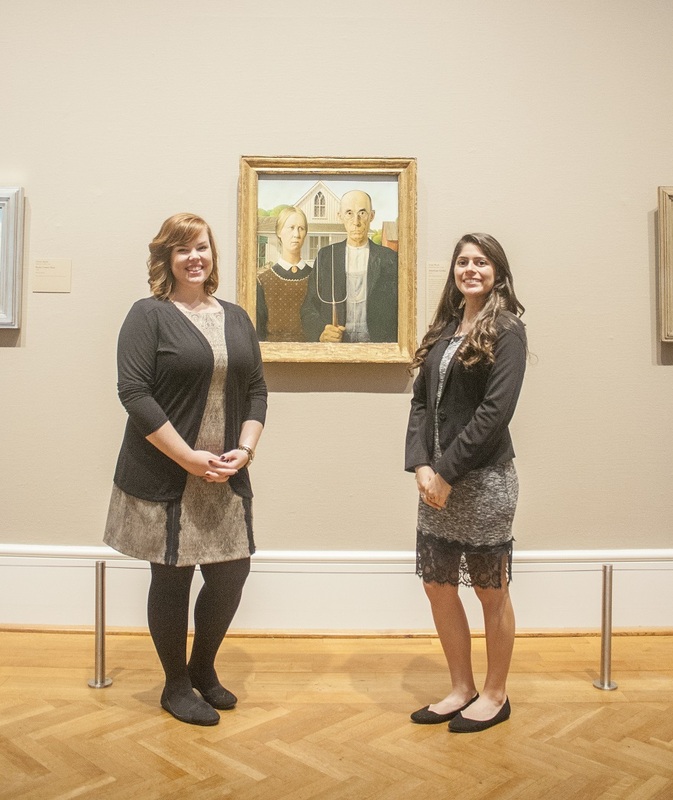 Constance was excited about her return trip through the extensive exhibits, she was most excited to view Grant Wood’s “American Gothic,” which was on loan during the LEAP Center trip to the Film and History Conference last year. 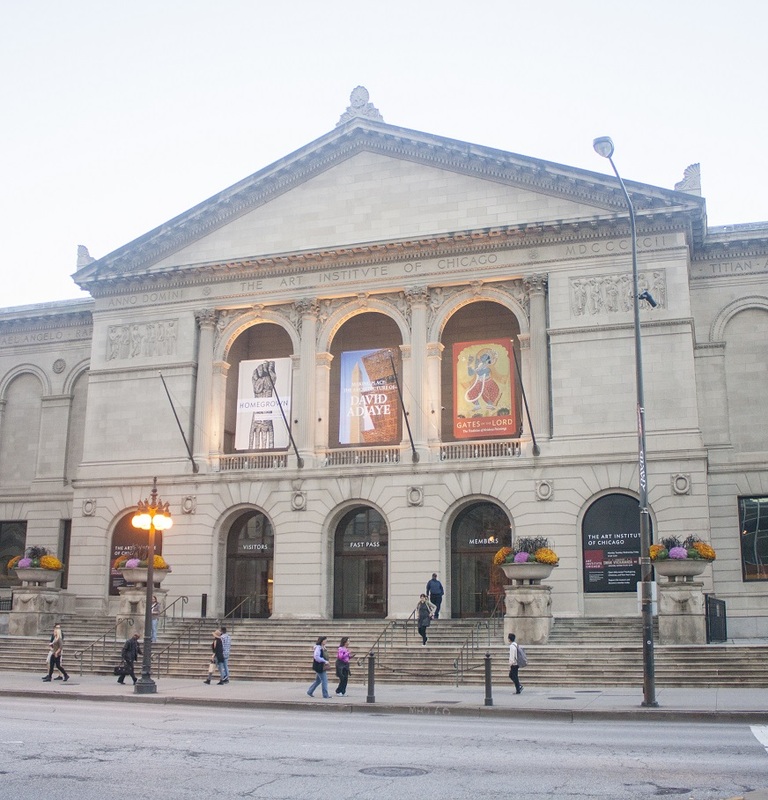 Alex, on the other hand, reported being overwhelmed upon entering the vast lobby of the 122-year-old building originally built to house the 1893 World’s Columbian Exposition. 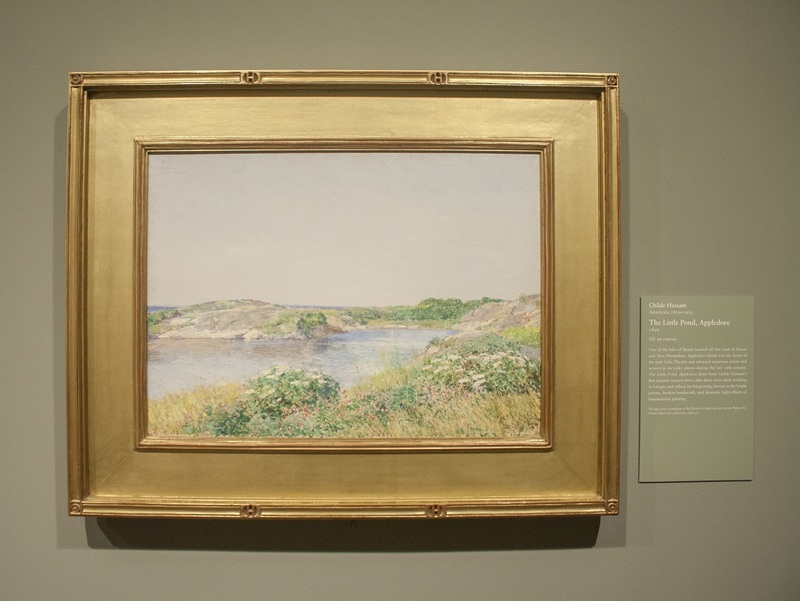 Next, we headed to the much-anticipated Impressionist exhibit to find Renoir, Degas, and Monet. 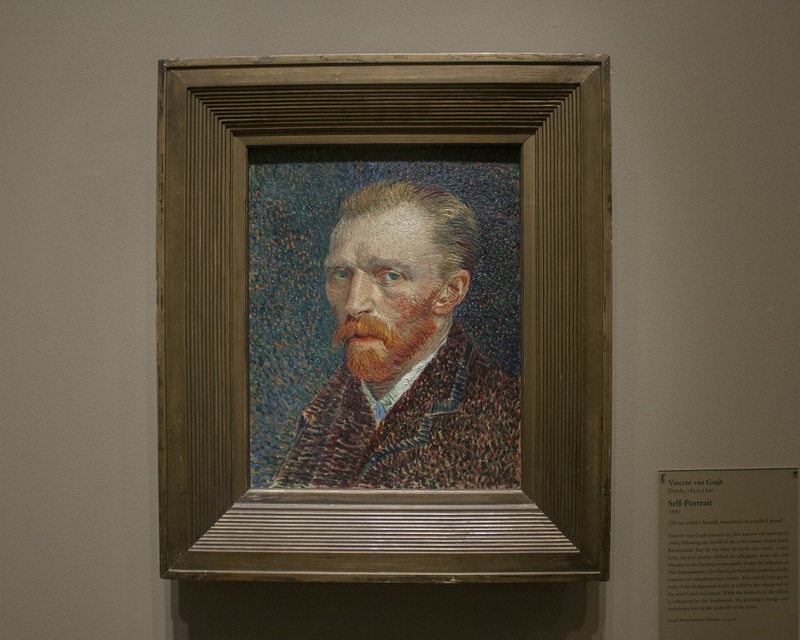 We also saw Vincent Van Gogh’s famous self portrait. It was also a chance to make connections to other things we’ve seen and done. 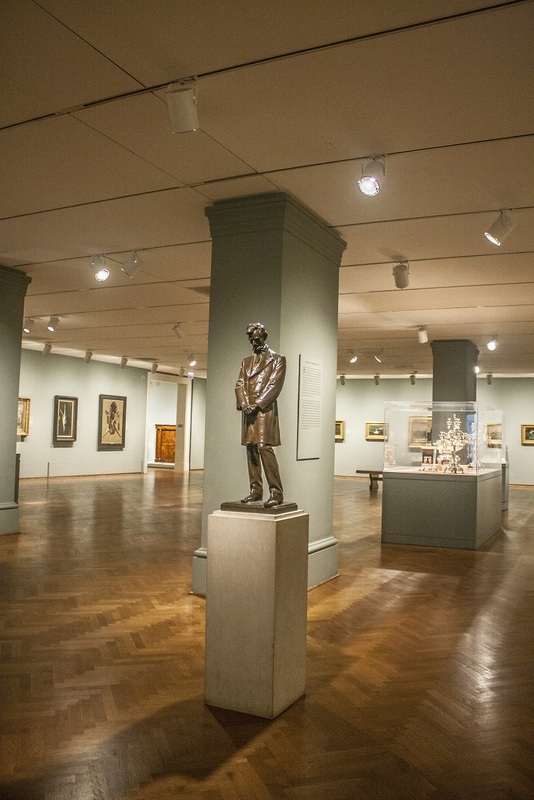 The Museum, for example, had a statue of Abraham Lincoln by David French, whose also did the statue for the Lincoln Monument, a replica of which also graces Lincoln’s Tomb. 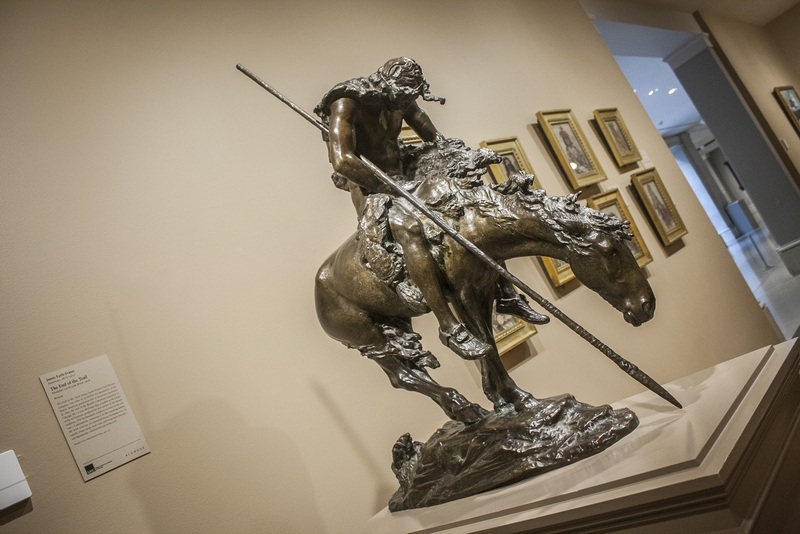 There was also a sculpture of James Fraser’s “End of the Trail,” the larger version of which Constance had seen on her first LEAP Center trip to Oklahoma City. Finally, we also had the chance to view an expansive exhibit of sketches, paintings, and even sculpture by Edgar Degas, famous for his dancers. Both of us have seen his house in New Orleans, on separate LEAP Trips. 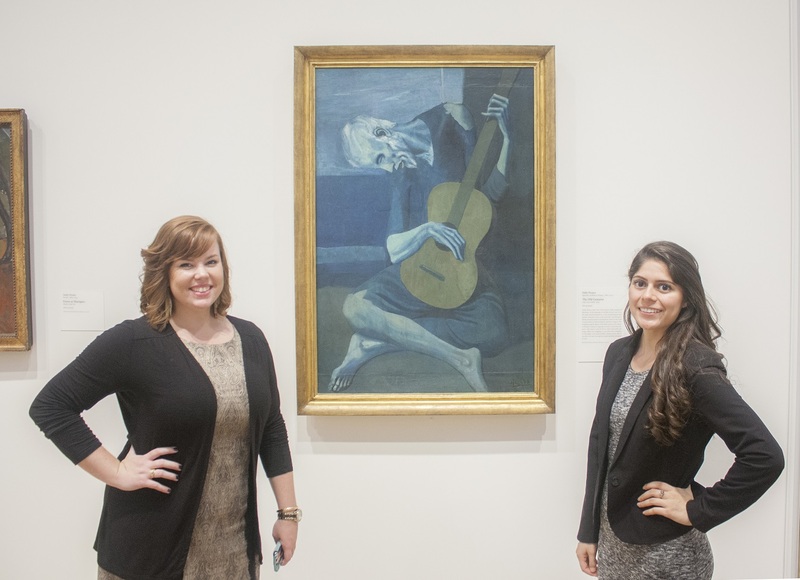 Alex, new to Dali and Matisse, commented on the distinction their art holds in the easily recognizable themes in their pieces. We left the museum, awed by the history we had encountered and encouraged by the inferences we can begin to make as our repertoire of art knowledge grows. With the sun setting, we began a brisk walk towards our anticipated yet unnerving next destination, Willis Tower. Built in 1973, the 108-story building rose above us, almost as if to gloat in its terrifying height. 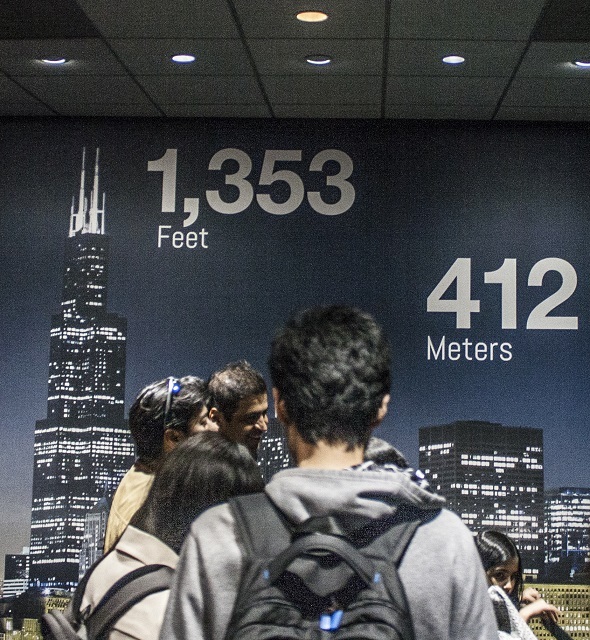 We bought our tickets, entered the elevator, and began ascending to the Skydeck at a whopping 17 miles per hour (or 24 feet per second), finally reaching the top, 1,353 feet high. 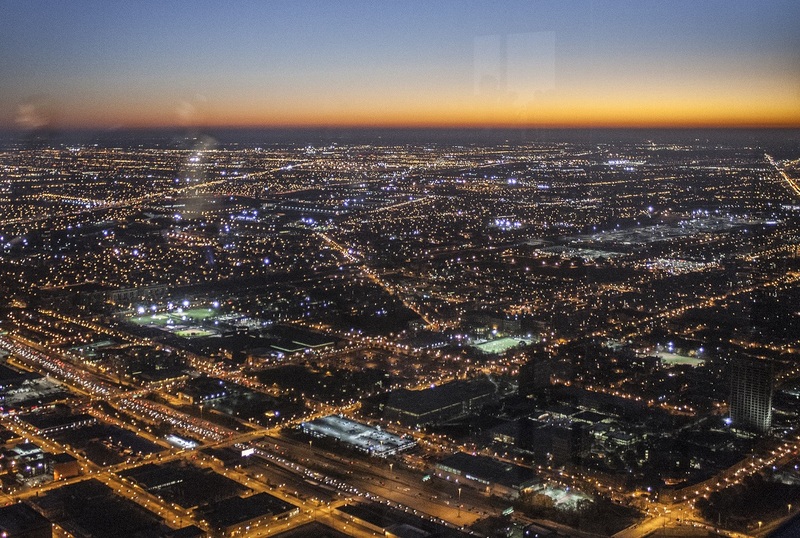 At the top, we encountered 360-degree views of the Chicago skyline at sunset. It was completely worth the frightening elevator ride. Mustering much more courage, we even had the chance to stand on a clear floor 1300 feet up in the sky, which was beyond our comfort zone. 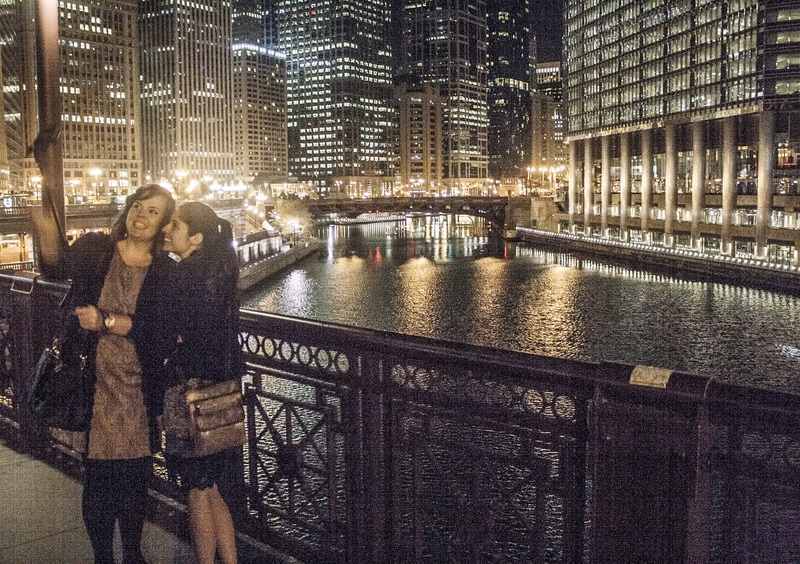 With that behind us, we had an impulse to leave, but we stayed, continuing to document Chicago’s descent into night. to meet with former Junior Fellows President, Daniel North – a reunion of sorts for Professor Yawn and Stephanie, and an introduction for us. Daniel showed us the equivalent to the LSC Ballroom at SHSU, where we sat while Daniel described his life at law school along with his plans after graduation, answering our questions about law school, and reminiscing about his time at SHSU and as a member of the Junior Fellows. Daniel also showed us the courtroom where the Loyola Moot Court teams argue, and the Loyola law library, where we can expect to spend numerous hours in study. 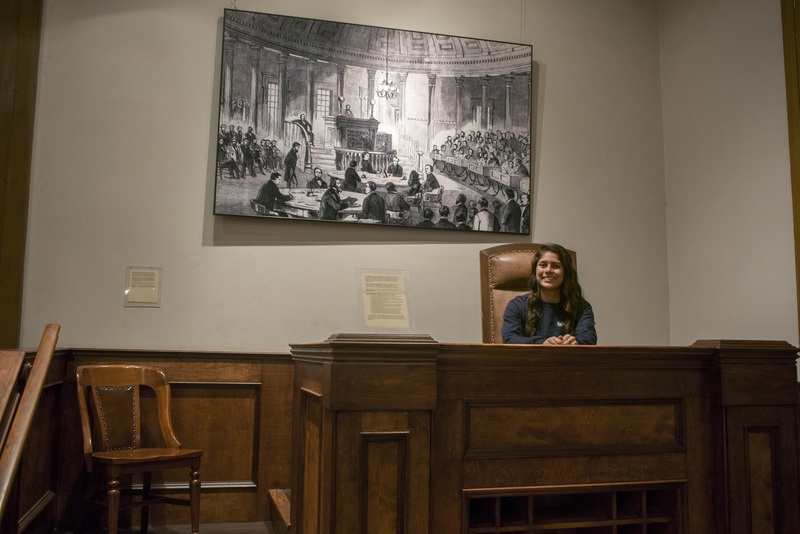 It was another connection for Alex, who recently spent time at UNT and TTU Law School Courtrooms as part of her Moot Court Experience. We also attended a Professional Responsibility class session with Daniel and his classmates. We sat in the back row of the class where we could see all the students prepared for class with their laptops, water bottles and books. Professor Grogan was passionate about what he was teaching and incorporated many previous cases which he has encountered (or taken an active role in) to help students understand the material. 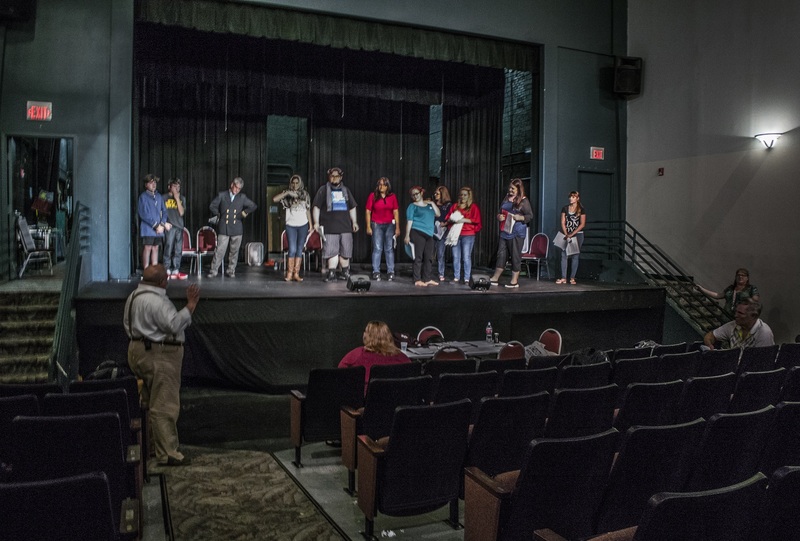 Professor Grogan made the class exciting and kept his students engaged by incorporating humor. The main topics of discussion during the class were contingency, ethics, fraud, and a brief note on veterans, which quickly captured Constance’s attention. The hour and forty-five minute class flew by because of the interesting material and discussion. It was an amazing experience for us, and we were very grateful to Daniel and Loyola Law for giving us this opportunity. 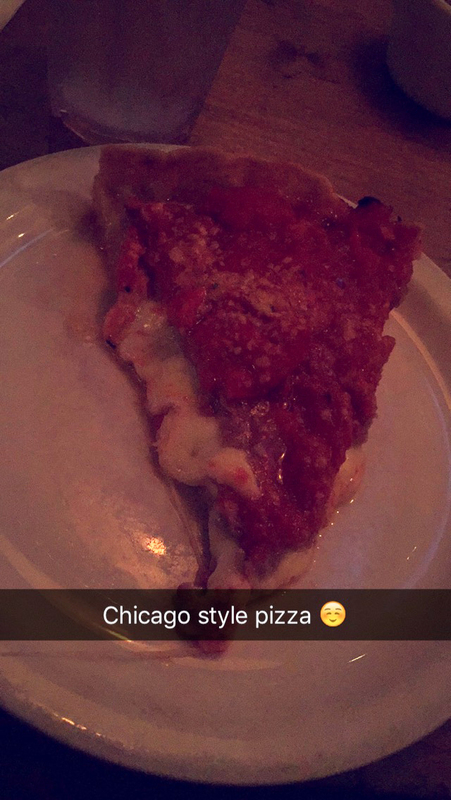 we shared a “classic” Chicago-style deep-dish pizza, filled with cheese and topped with a layer of sausage. Daniel suggested that one slice would be enough, and one slice was definitely enough for most of us! 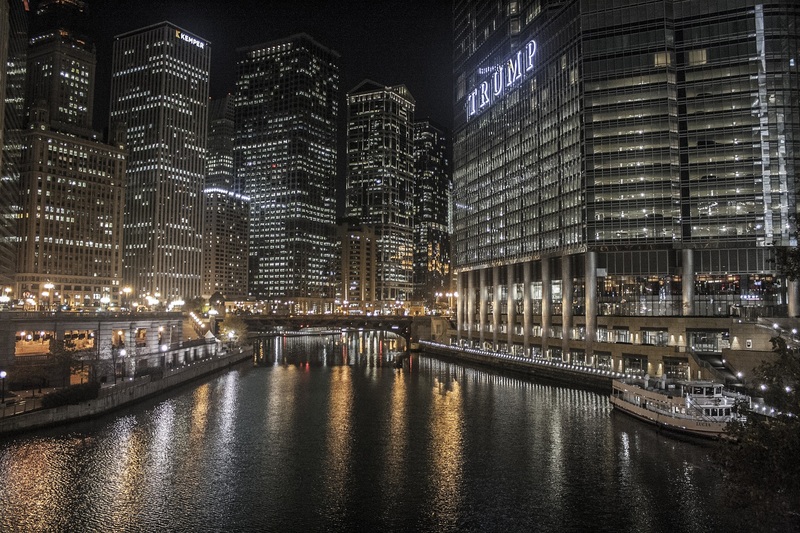 After such a filling dinner, we hoofed it for about a mile and a half across Chicago, checking out the beautiful architecture and river scenes. …who, for reasons unknown, is obsessed with Donald Trump. Getting in past midnight, and leaving Chicago at 6am, we returned to our hotel, with a busy and bustling day to reflect on as we descended into sleep. Midwest, Day 2: Show Us St. Louis, MO! Signifying expansion into unknown territory, the Gateway Arch stands 630 feet tall in the St. Louis skyline, beckoning travelers to explore what the city has to offer. 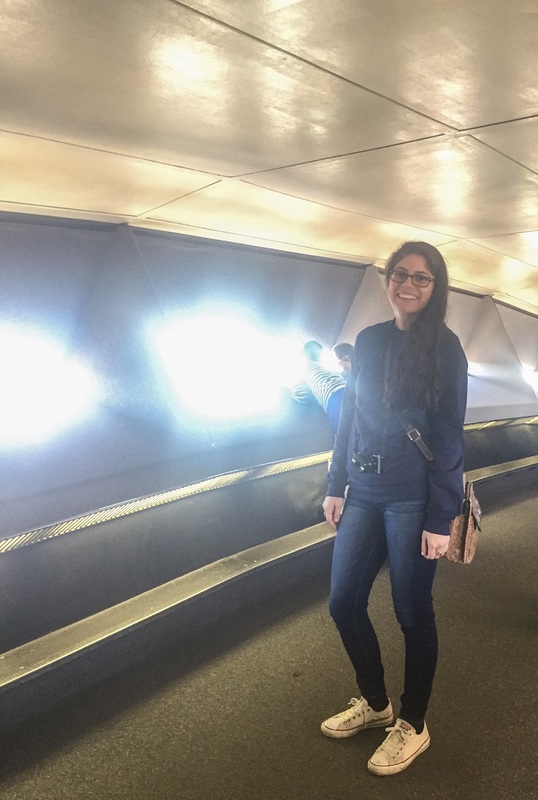 Designed by Eero Saarinen, completed in 1965, and designated as a historic site in 1987, the Gateway Arch is visited by thousands annually from all over the world. 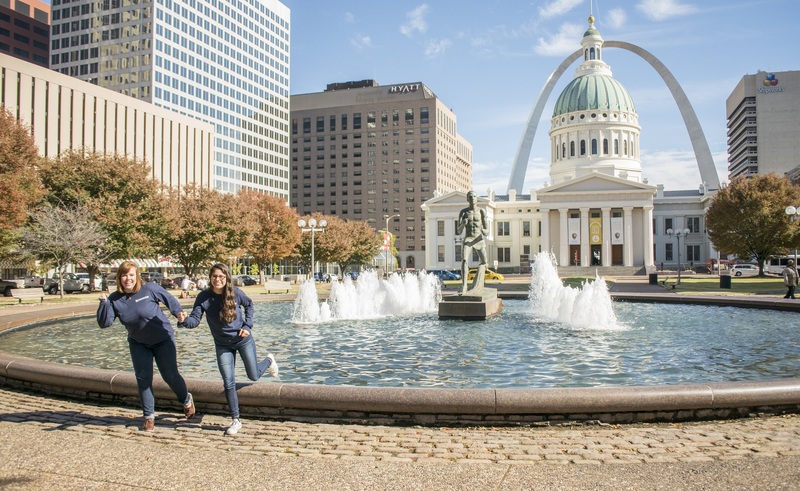 Located between the Mississippi River and the Old Courthouse, the Gateway Arch stands 630 feet high–tall, indeed, especially for two people who do not like heights. Undaunted, we embraced the moment, commemorating with a photograph. We then proceeded to hop into a pod that transferred us from underground into the skies of the city. I (Constance) don’t care for the pod much. 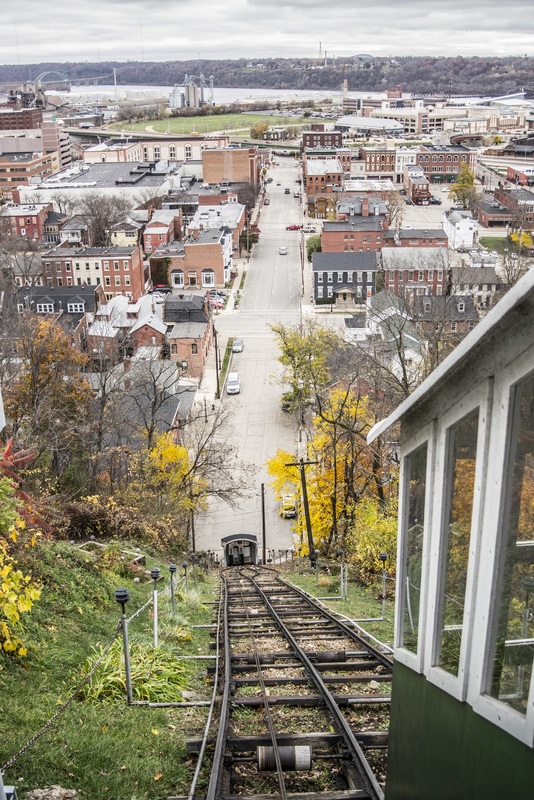 After a five-minute ride, we disembarked, climbed a few stairs, and were confronted with windows to the east overlooking the Mississippi and beyond. 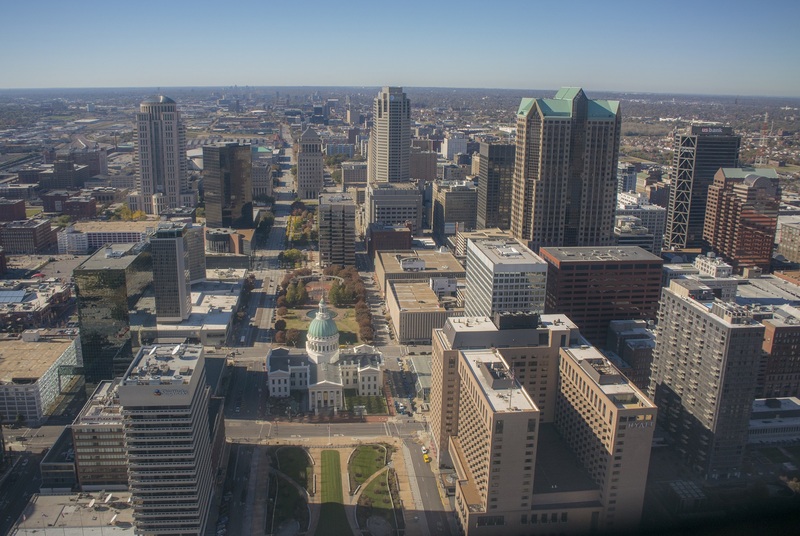 On the opposite side, we enjoyed a bird’s eye view of the Old Courthouse, Budweiser Park, the Wainwright Building, and the Edward Jones Dome, home to the St. Louis Rams. These views come courtesy of small windows in the middle of the arch. 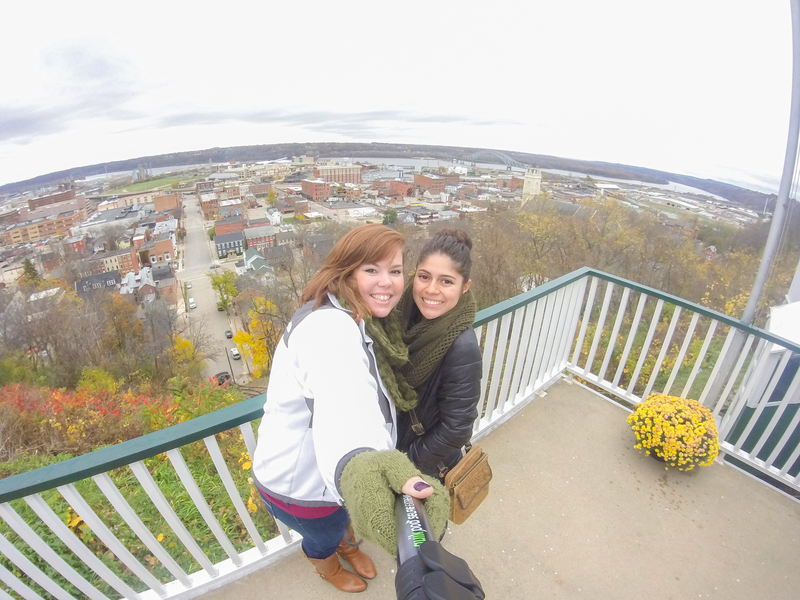 Taking in our fill of the city, we snapped a couple selfies and got back in line to descend to the bottom once again. 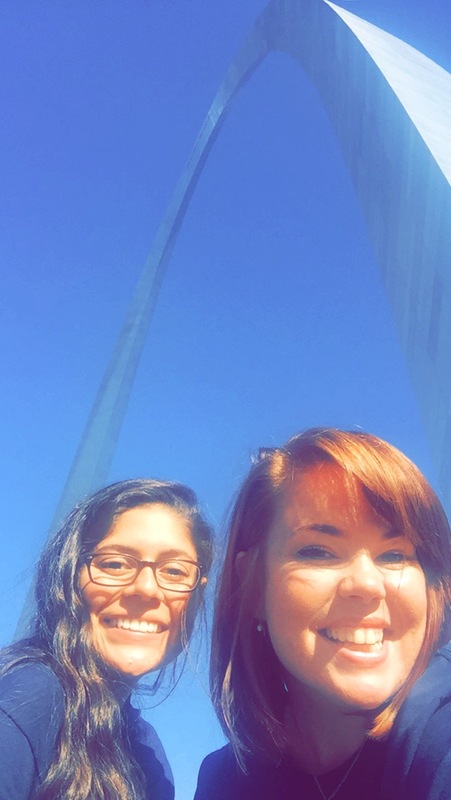 We left the Gateway Arch to return to the Old Courthouse, where the Dred Scott trials occurred in 1847 and 1850. Construction began in 1816 but was not completed until 1828 by the firm of Lavielle and Morton. Since the first completion, Henry Singleton added an addition of three wings and a center cupola dome in 1839, which lasted until 1851, when the east wing was replaced. and different structural intricacies, and posed for quite a few pictures as well. The courthouse differs today from the 1839 version because William Rumbold replaced the cupola with a dome in 1861, modeled after St. Peter’s Basilica in Vatican City.Standing in the center of the main hall looking up, we had the chance to view the dome from the inside-purples, blues, pinks, and greens all around. 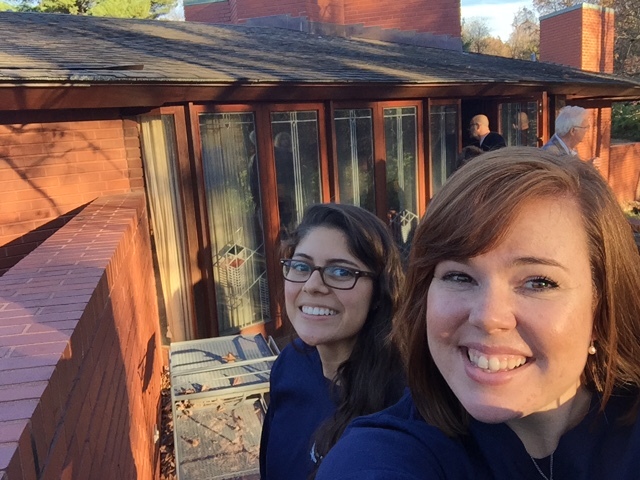 After spending as much time as we could inside, we headed out to venture back to the car and drove outside of the city to the most anticipated tour of the day, a Frank Lloyd Wright home. We arrived at Ebsworth Park and drove through a winding driveway to arrive at our destination and learn more about Frank Lloyd Wright. Born in 1867, Frank Lloyd Wright was an internationally known architect in the early to mid 1900s. 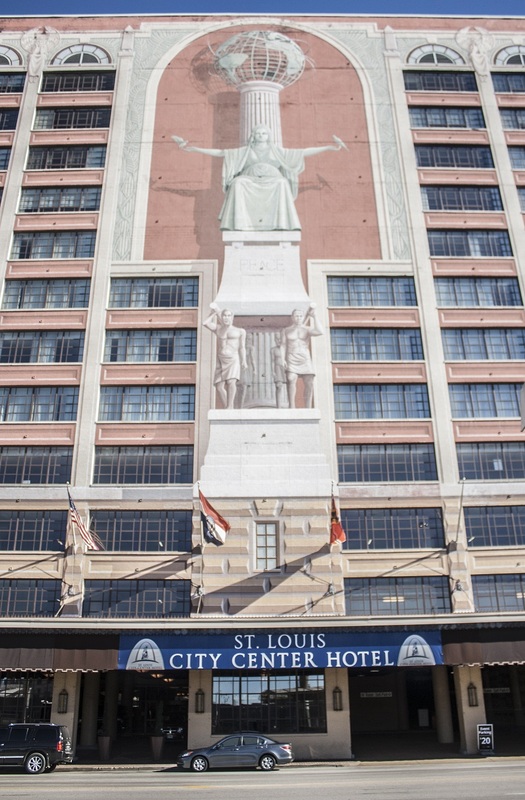 He built homes and buildings after learning from and working for Louis Sullivan, who is known for his work with skyscrapers and who built the Wainwright Building in downtown St. Louis. Wright built the home in Ebsworth Park for Russell and Ruth Kraus, a modest couple who doubted they had the funds to afford a home from such a well-known figure in architecture. 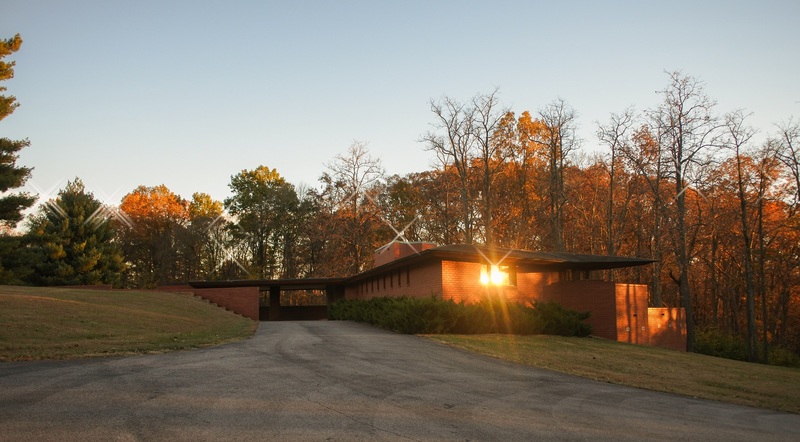 Instead, the architect surprised them with his acquiescence and proceeded to plan them a Usonian home. 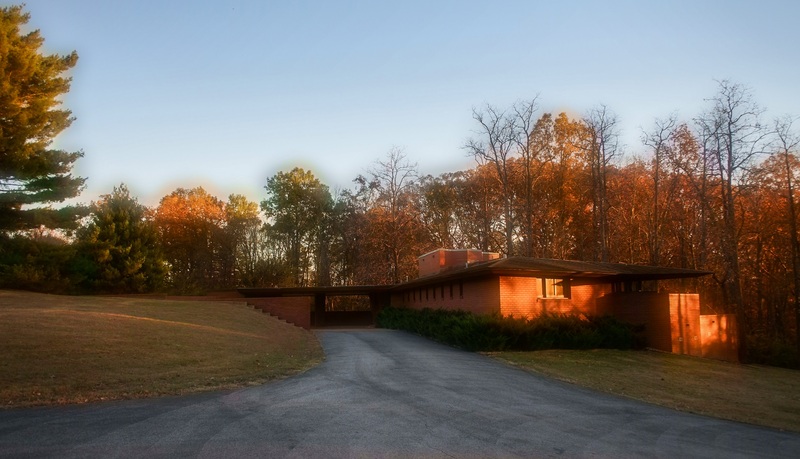 Known for its affordability and political implications, Wright’s Usonian theme, seen throughout the United States, encompasses smaller homes, with only one story, usually no basements, attics, or garages, and just enough space to be efficient. The home is laid out in grids, with parallelograms serving as the major building motif. Within the parallelograms, however, are embedded triangles and hexagons, and these three shapes make up the shapes in the home. In fact, there is only one ninety-degree angle in the home (the bathroom); the rest of the home’s angles are either 60 degrees or 120 degrees. We learned of Wright’s use of compression and expansion as we walked through the tight entryway and entered the spacious main hall of the home. 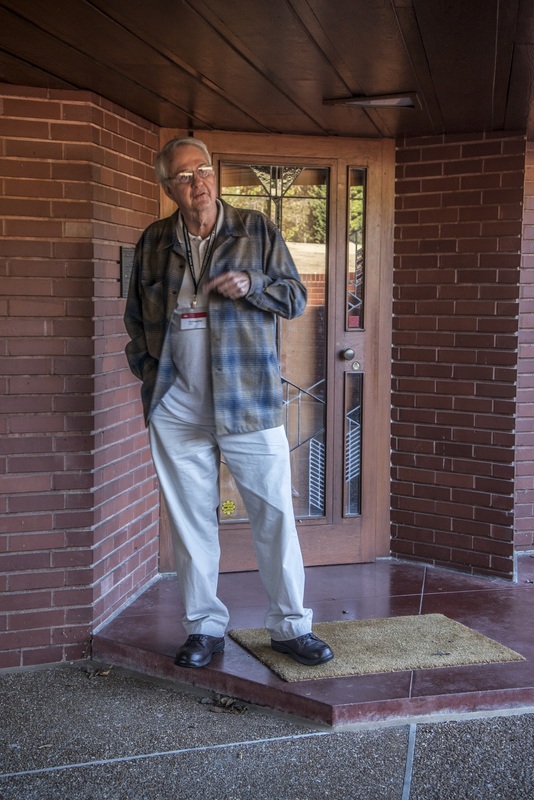 Docent Dave Baumgartner, a former architect in St. Louis, made the tour very enjoyable and provided much insight into the particulars of Frank Lloyd Wright’s architectural plans. Low tables and chairs, great windows, and open space pulled our view towards the outside of the home and into the great forest beyond. …we learned various innovations produced by Frank Lloyd Wright (e.g., larger bathrooms), the creativity he used to fit his homes to his ideas (in this case, he created a parallelogram bed for the Krases), to the meticulousness with which he planned out every detail (the screws in the home lined up with the angles produced by the home’s grid). We were awed by his presence still pervading the space to this day and left with minds blown by the genius that was Frank Lloyd Wright. 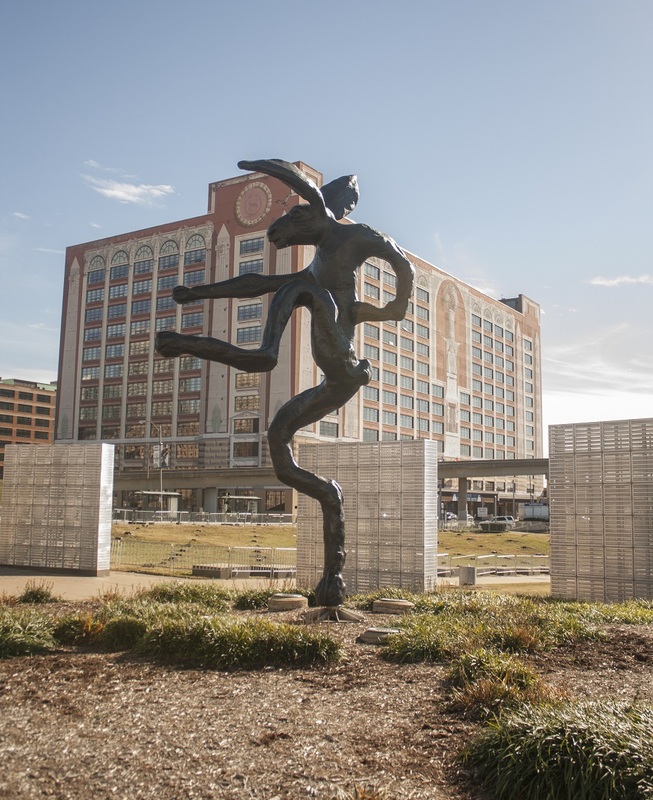 Intriguingly, St. Louis is also home to a building graced with a three-sided Richard Haas mural, fronted by a strange sculpture of a high-stepping jackrabbit (not done by Haas!). …has eight obelisks and numerous other adornments. 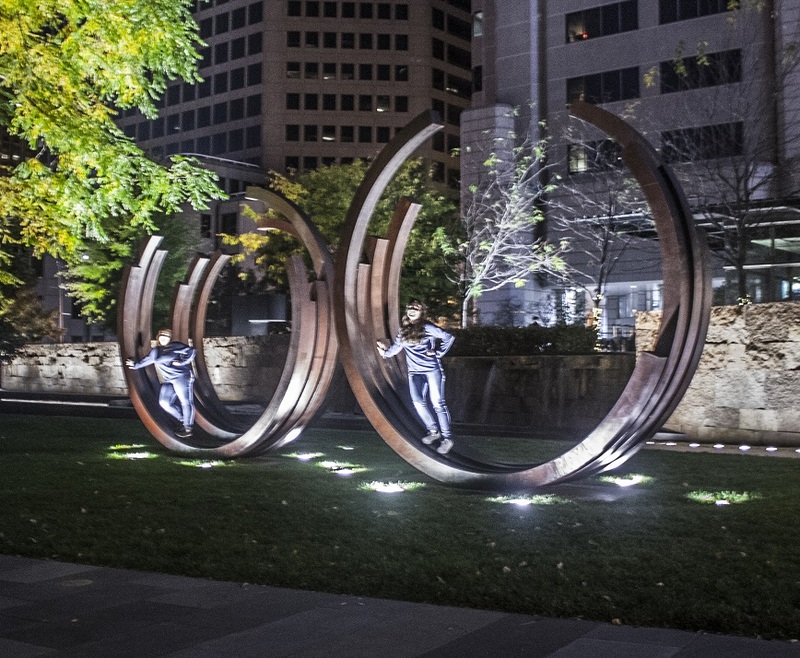 We were also able to spend time in St. Louis’ beautiful downtown “urban park and sculpture garden,” Citygarden. Incorporated into the “Gateway Mall” area, the park is bordered by Eighth, Tenth, Market, and Chestnut Streets – just a short walk from many locations within a downtown area that is actively trying to tie together green spaces and government structures, common spaces and the corporate sphere. Part of our group was fortunate enough to spend some daylight time in the park, with the sun setting alight the fall colors in many of the park’s varieties of trees. 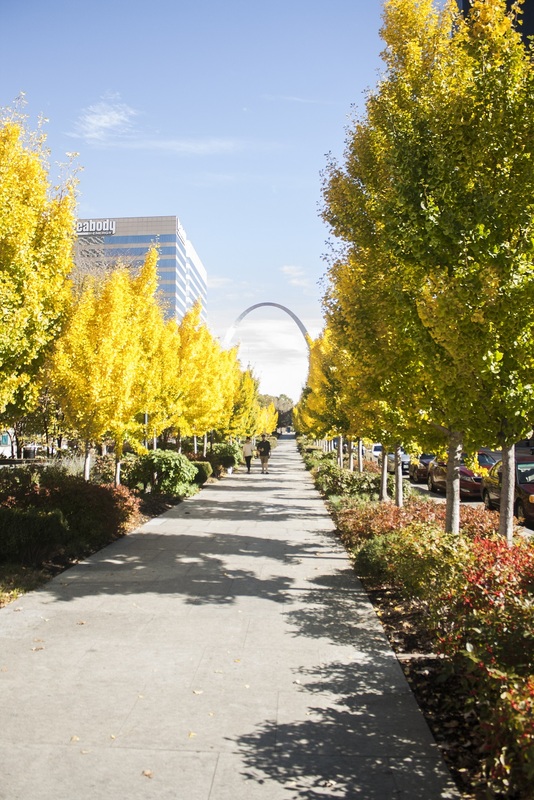 The procession of gingko biloba trees (also known commonly as maidenhair trees) positively glowed along the Market Street promenade, their yellow leaves glinting off the last of the sun’s rays. Mark di Suvero’s Aesop’s Fables. And Professor Yawn was proud that his pupils, Alex and Constance, finally and truly lived up to their name, serving as pupils in Igor Mitoraj’s Eros Bendato. 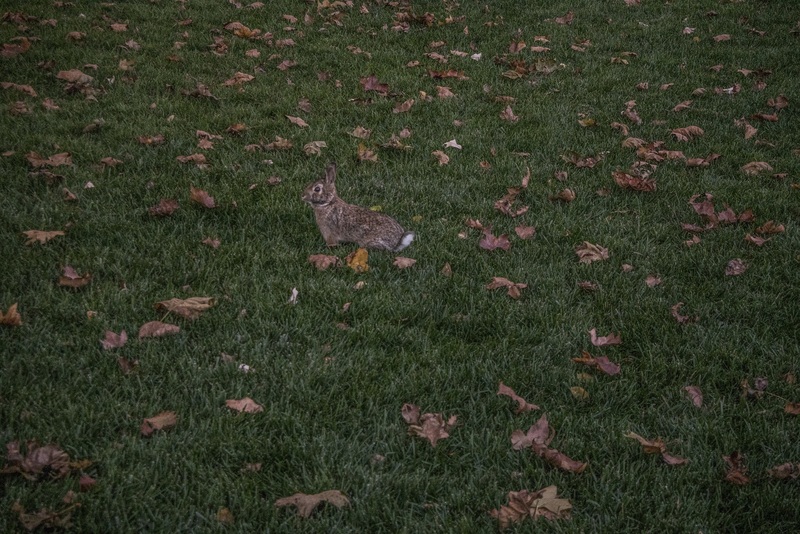 We even saw a rabbit! 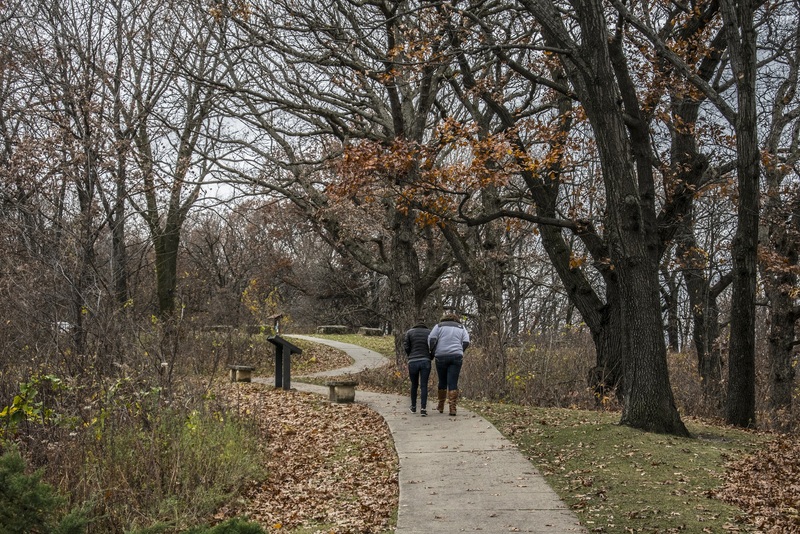 The park is a must-see if in St. Louis. Even a short stroll through the beautifully landscaped space evokes feelings of tranquility within. 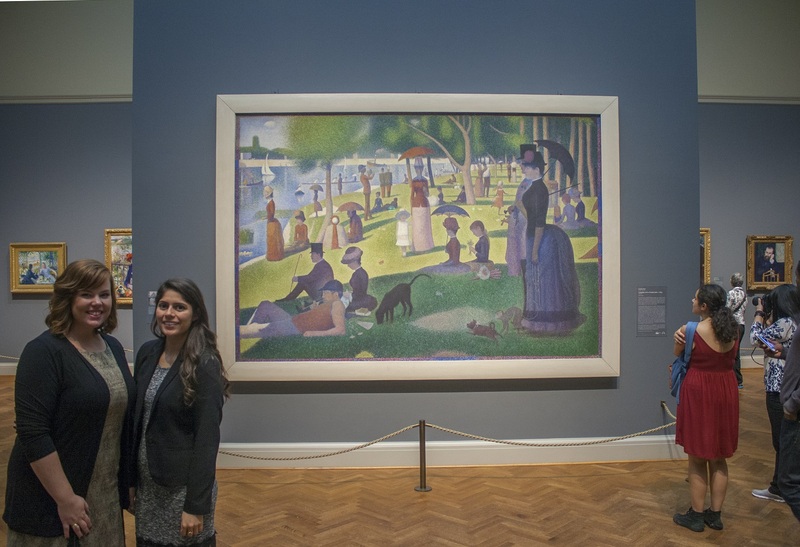 Park maps that provide info on all the art pieces are available; or one can download the app, with even more information on the park’s amenities and scheduled events. Well, we had some fun again, at the end of a long day, but in the midst of a fun trip. 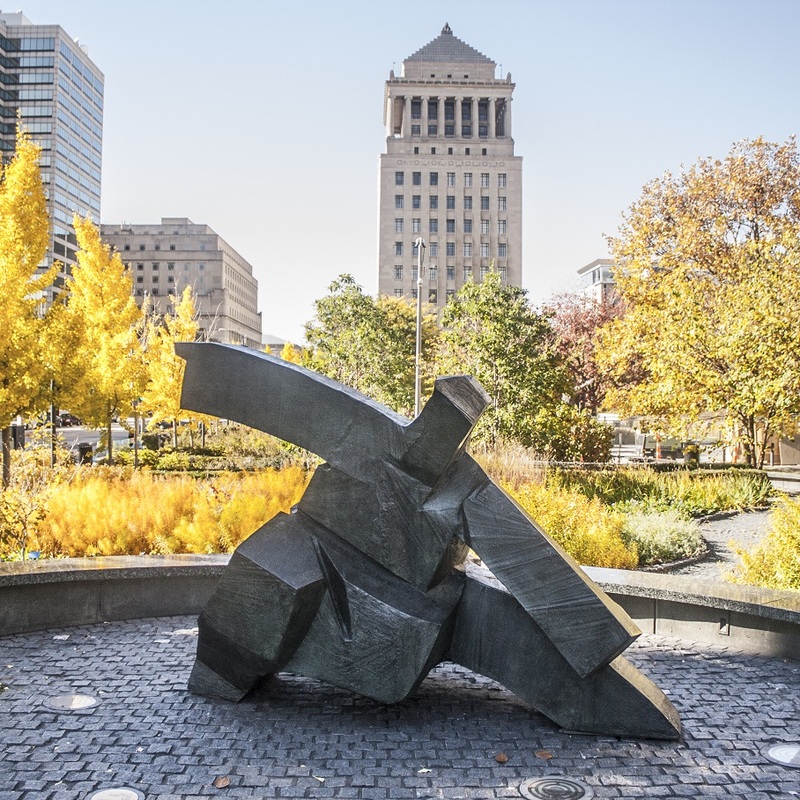 Author mikeyawnPosted on November 3, 2015 Categories Art, Civil Rights, Law, TravelTags Citygarden, Dred Scott, Frank Lloyd Wright, Gateway Arch, LEAP Center, Richard Haas, SHSU, St LouisLeave a comment on Midwest, Day 2: Show Us St. Louis, MO!